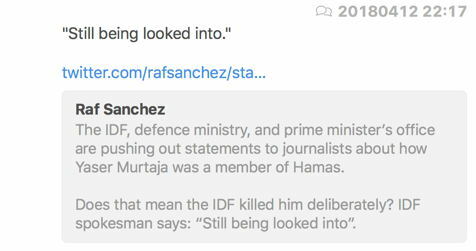 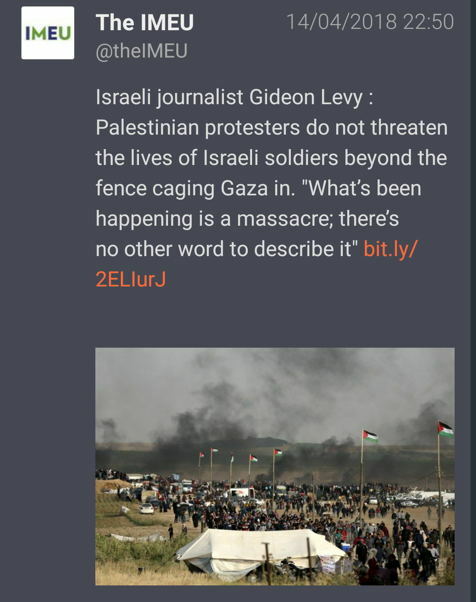 Words fall short describing the recent events at the fence around Gaza. 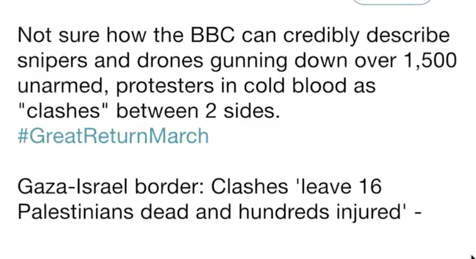 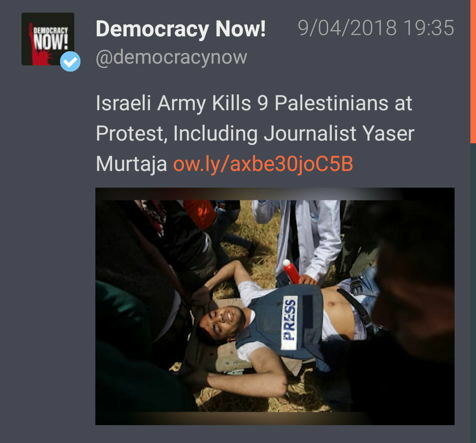 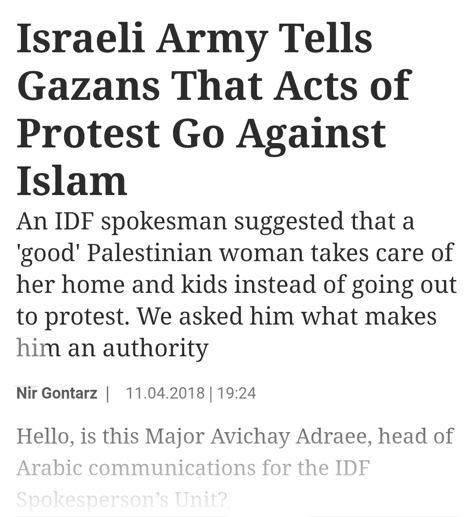 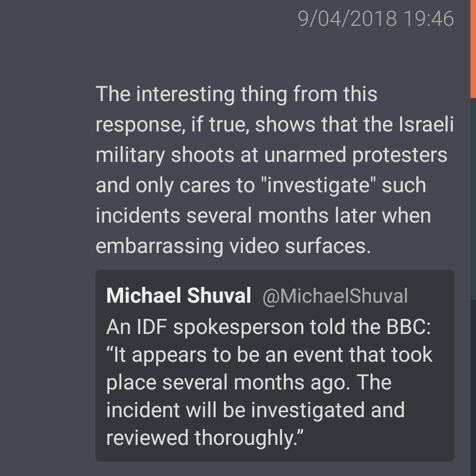 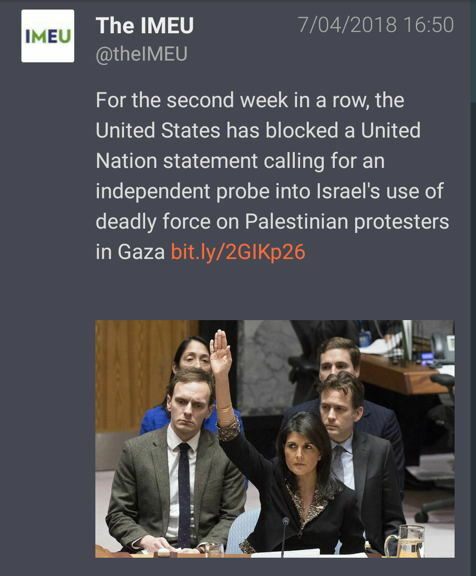 Unarmed Palestinians demonstrated for their dignity of life, for water, electricity, for their right to live as the rest of humanity, and for their right of return, when they were confronted by the world's ’most ethical army’ (aka IDF) - as they like to call themselves. 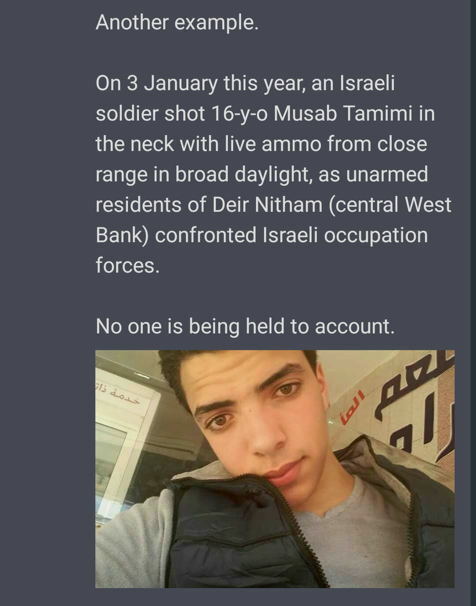 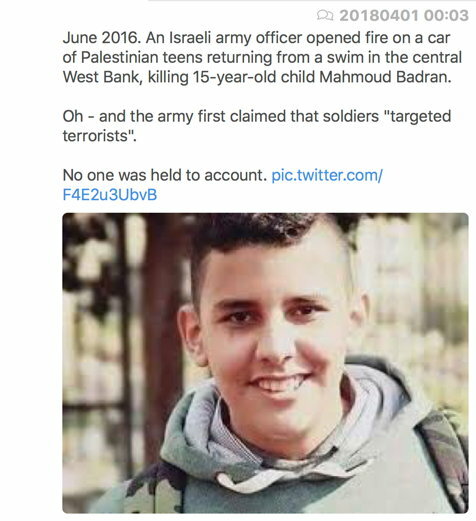 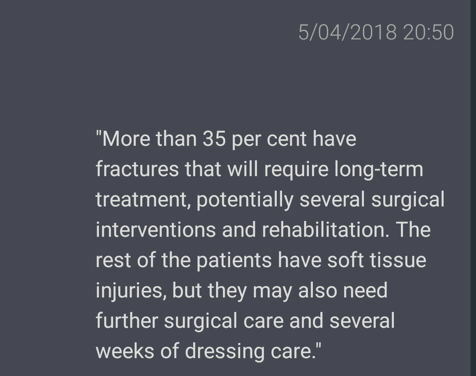 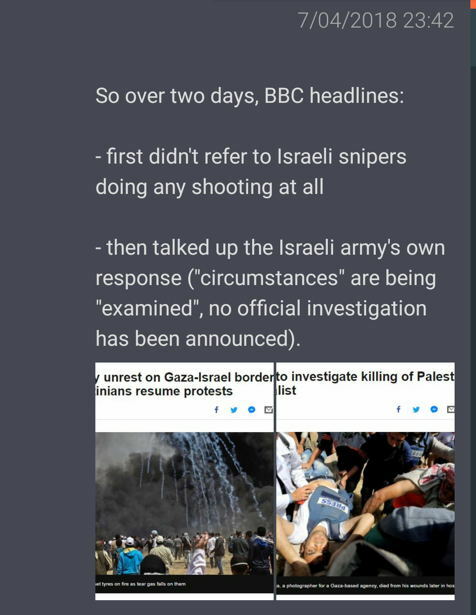 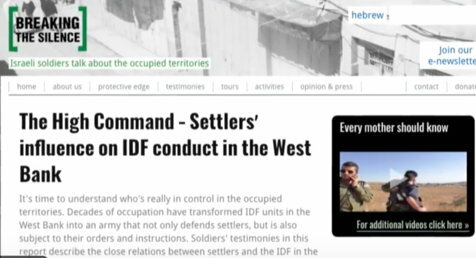 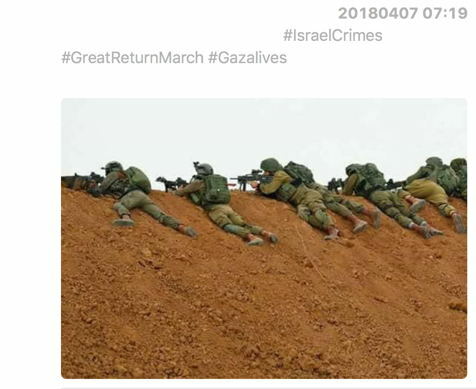 In reality the soldiers of the occupier sat snipers behind sand hills and did not hesitate to kill a considerable number of civilians (40+), also children! 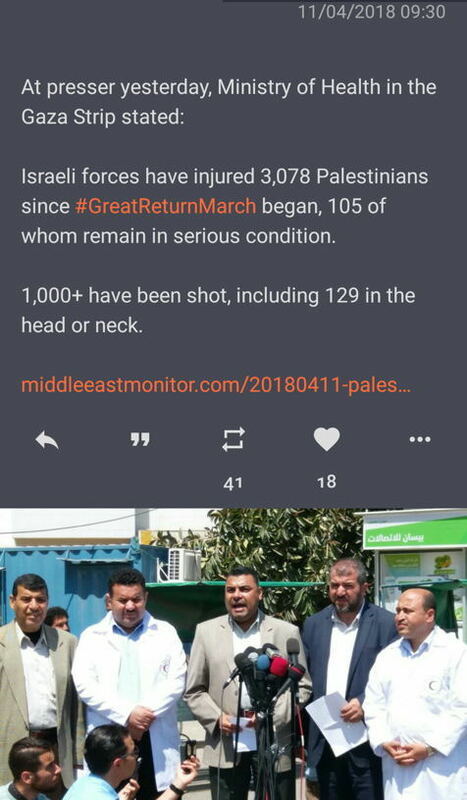 - and a great number of wounded ( more 1700 ! 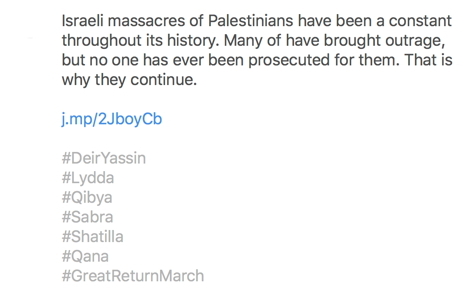 and counting).All this at the orders of their ruthless commanders. 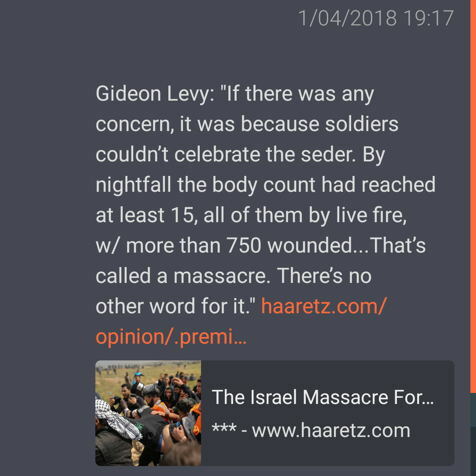 These crimes stem from the deviant Rabbinical interpretations of the ’Old Testament’, where the master has to subdue the servant by whatever means, including torture and death. 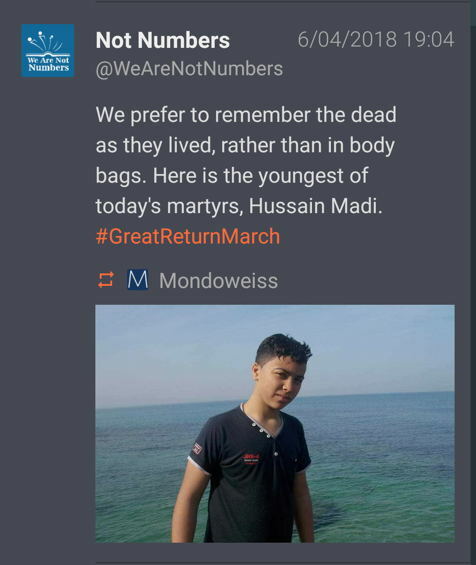 No mercy - merciless. 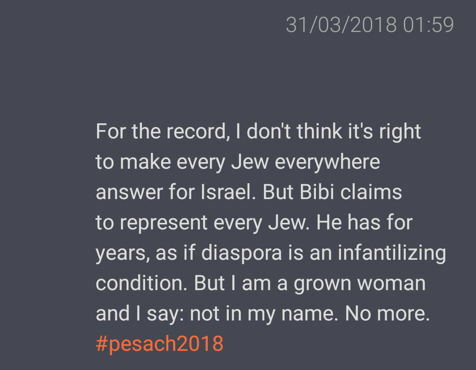 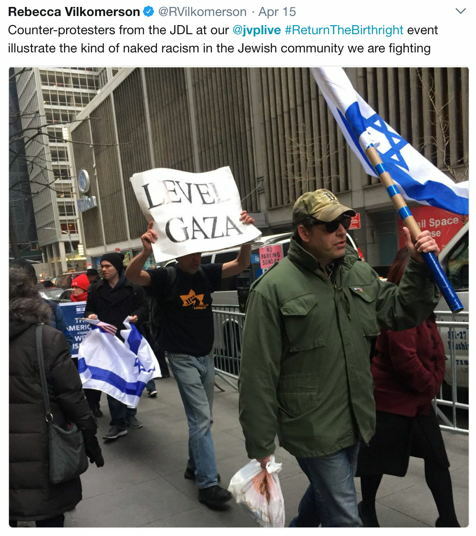 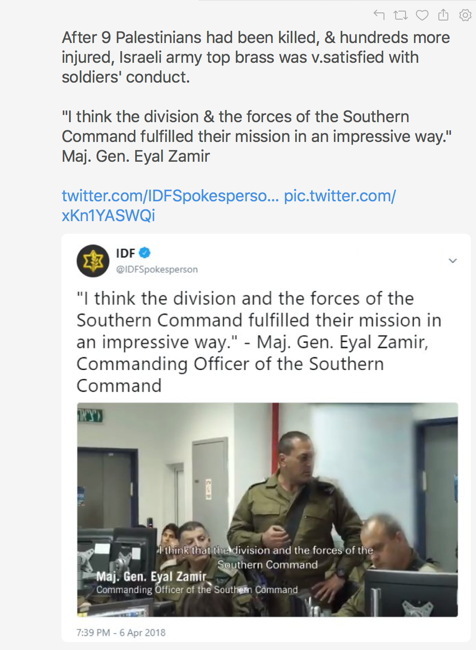 Their racist and supremacist ideology (clad into a deviant form of Judaism) has brainwashed them to believe they are superiour to all other nations, who can be treated at their whim. 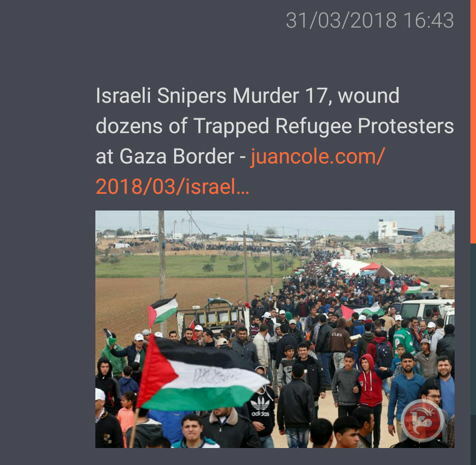 ”And if ye walk contrary unto Me, and will not hearken unto Me; I will bring seven times more plagues upon you according to your sins. 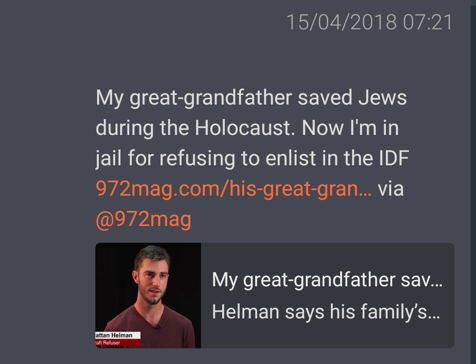 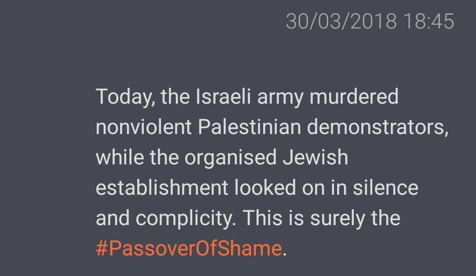 However, more and more Jews and their remaining friends are turning away from these aberrations. 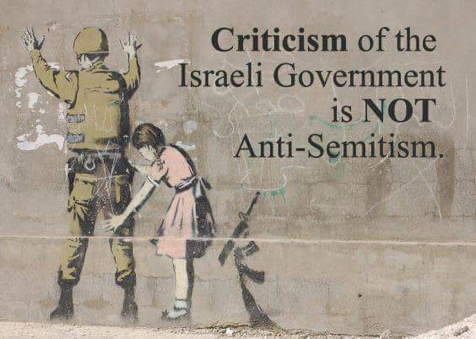 Truth cannot be ignored and will come forth, just like the sun brings light to day. 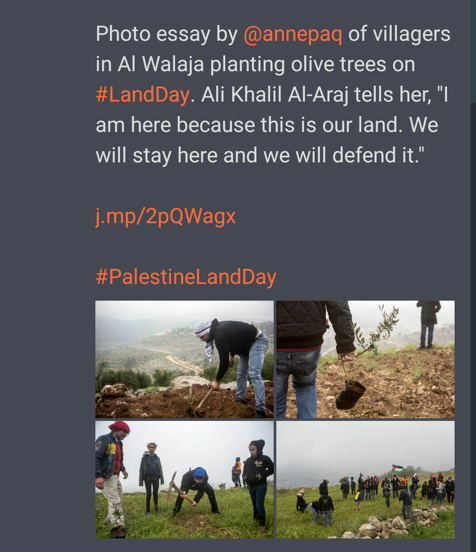 The truth is that the Zionists took - and still take today -the land from the Palestinians, who have lived there for generations, even for 2000 years and more! 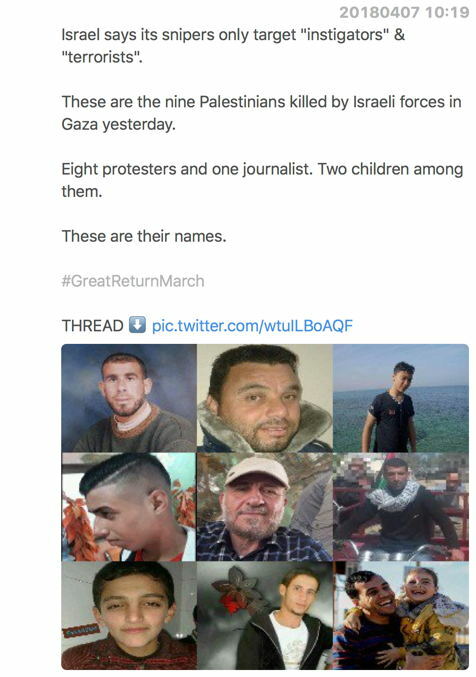 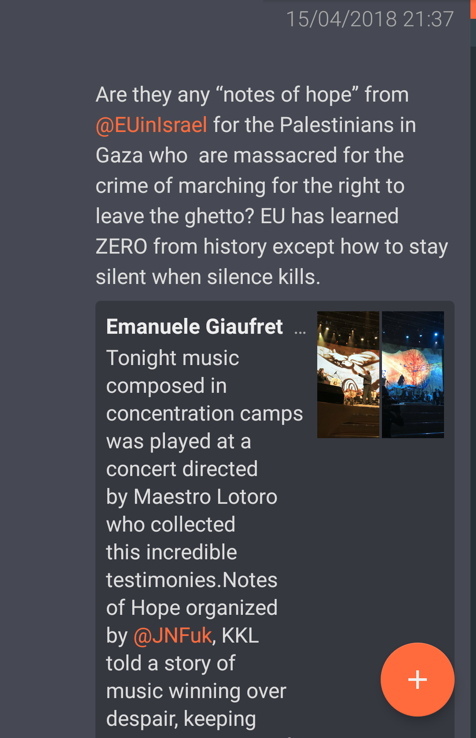 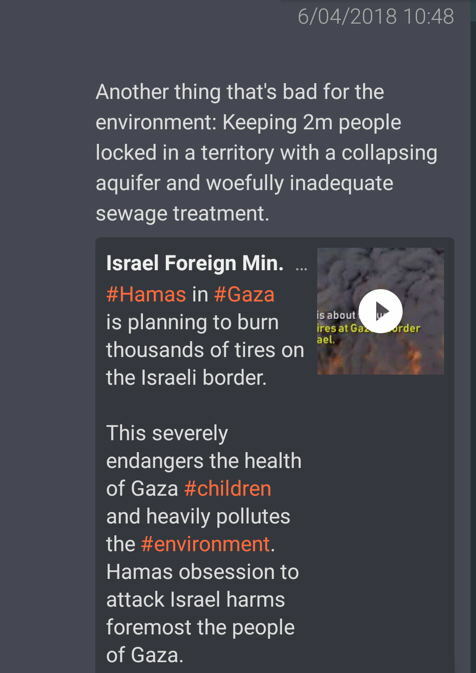 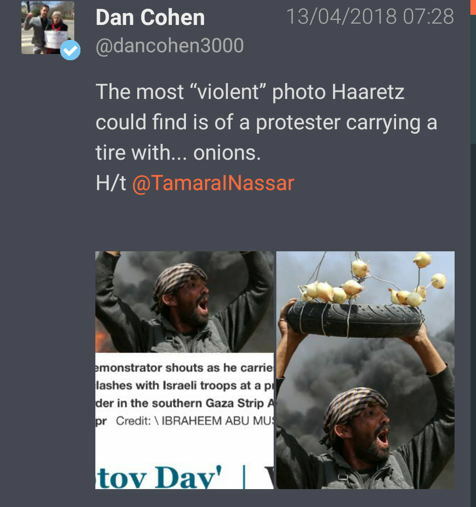 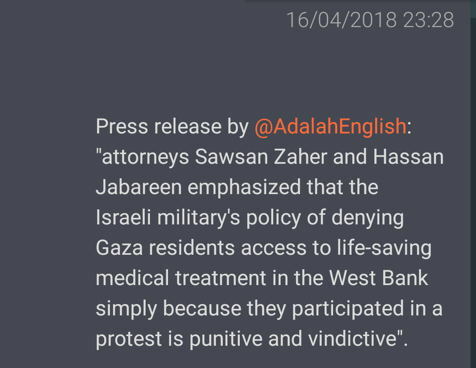 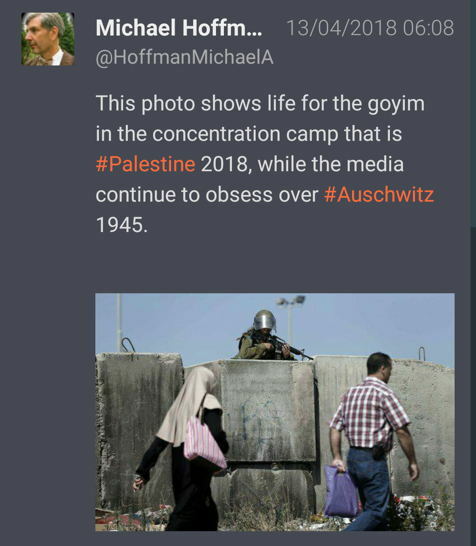 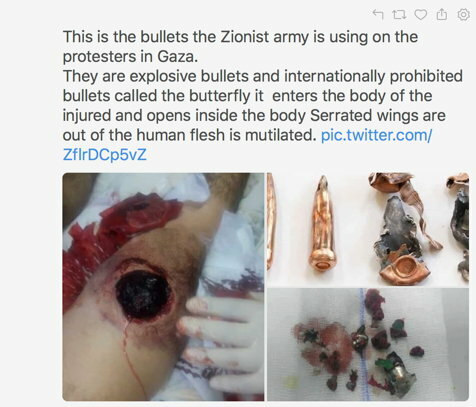 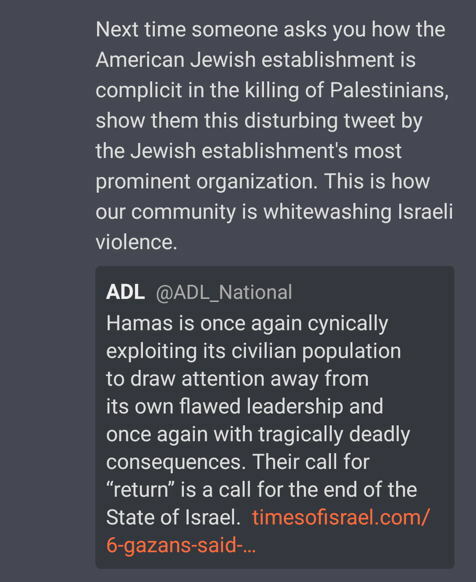 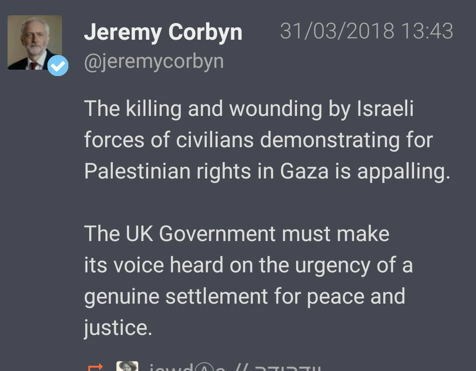 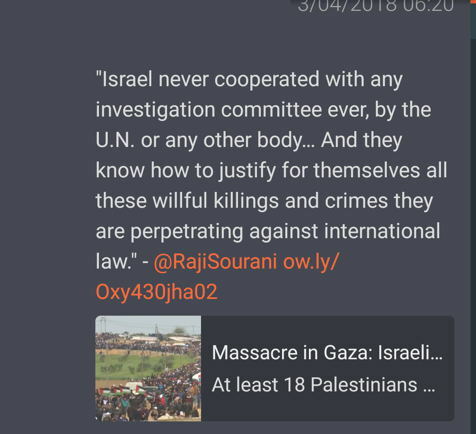 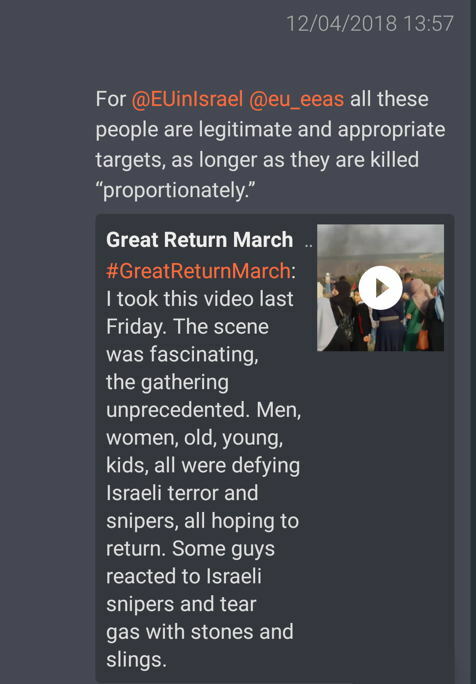 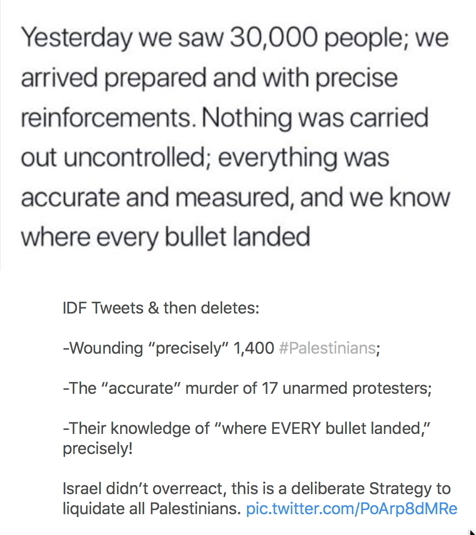 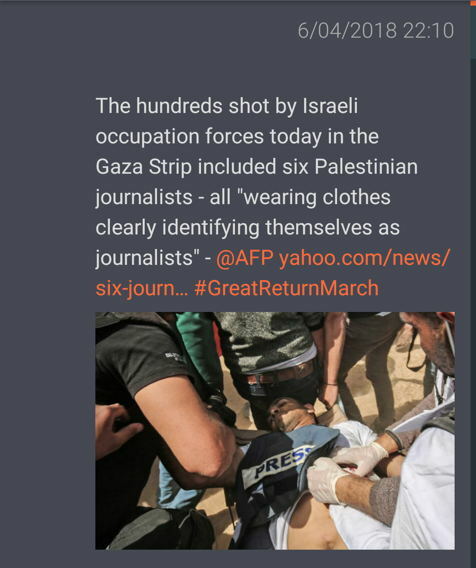 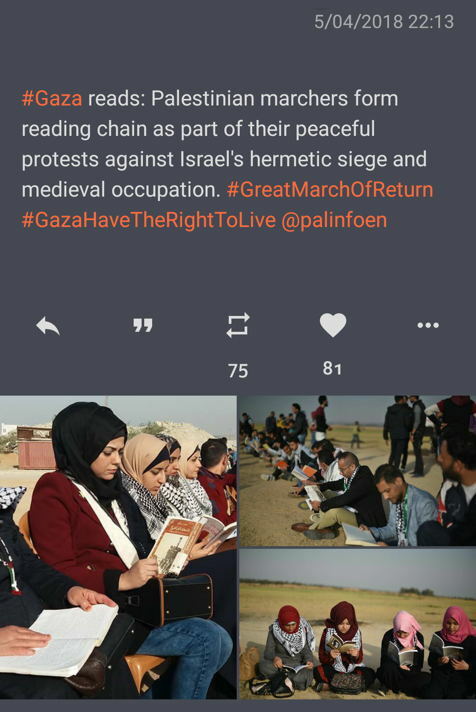 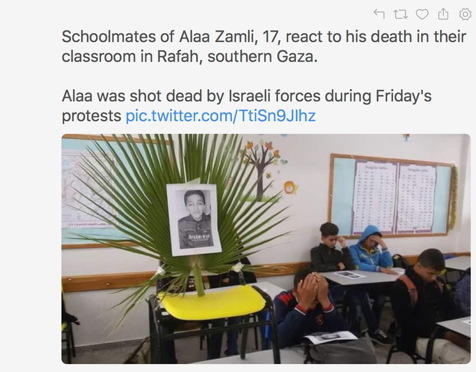 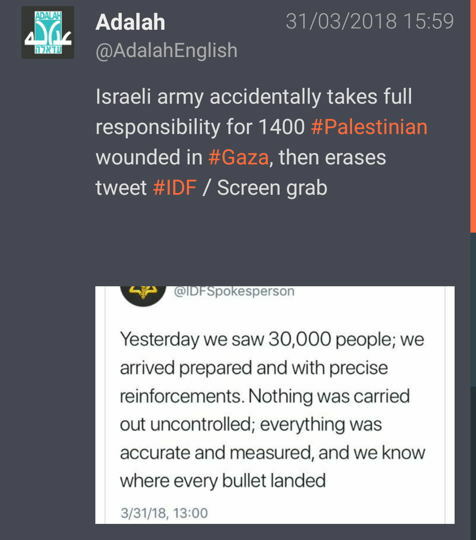 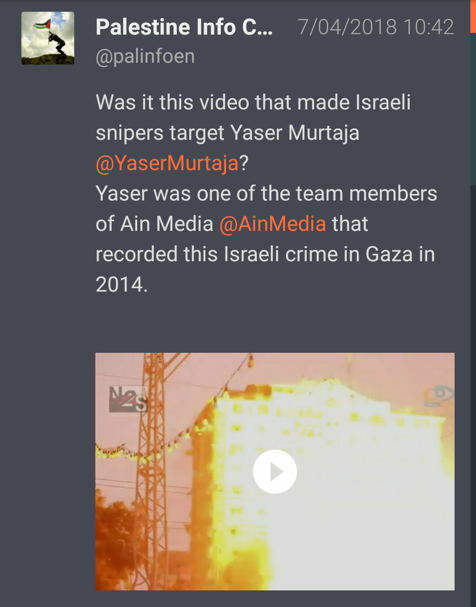 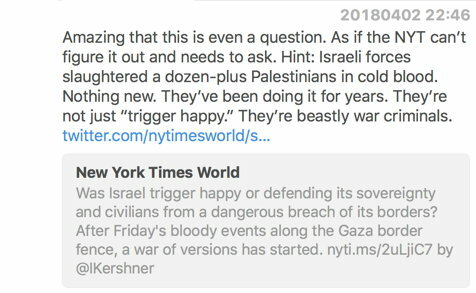 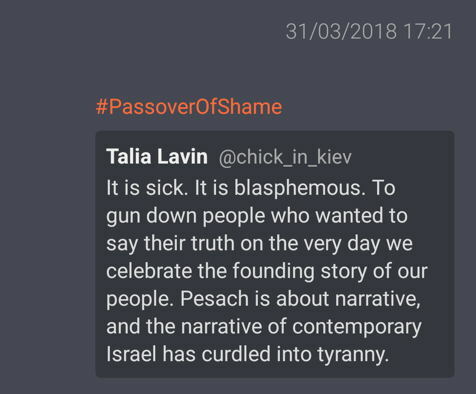 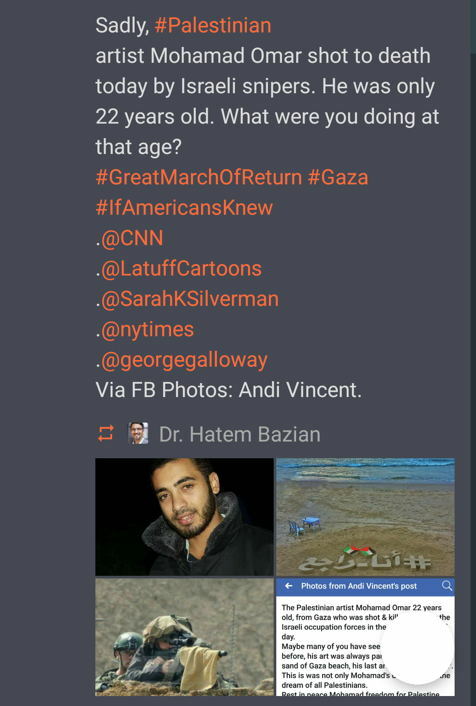 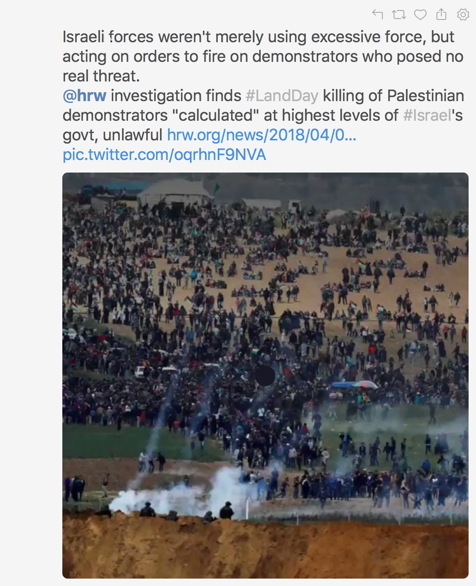 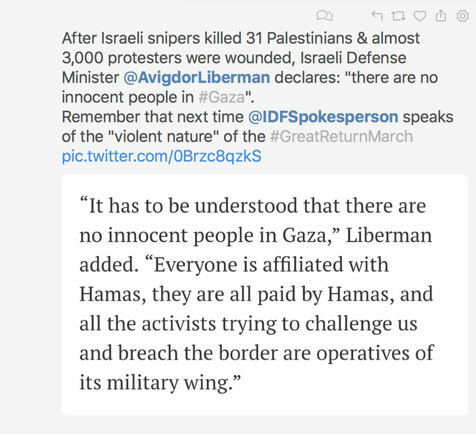 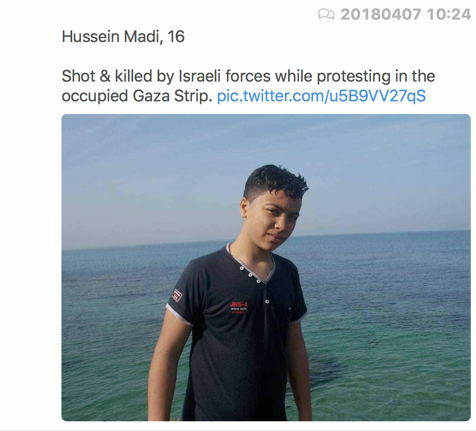 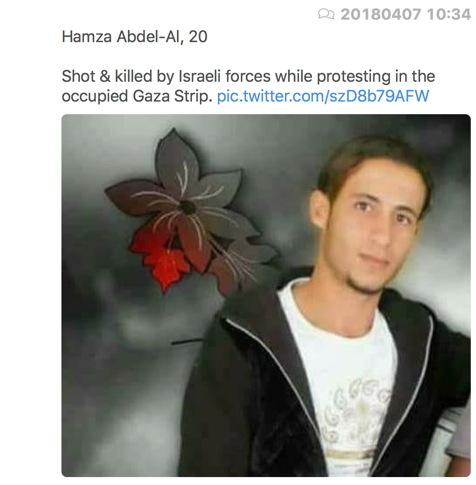 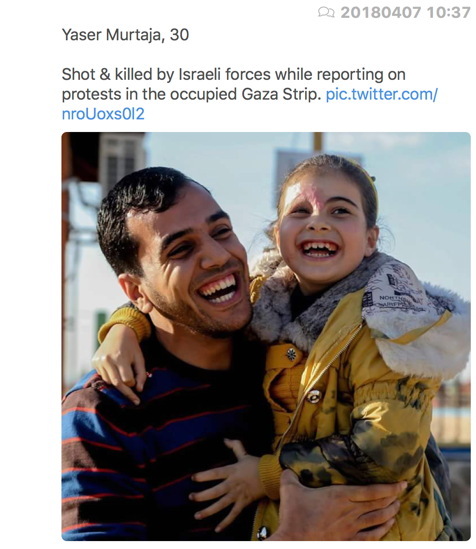 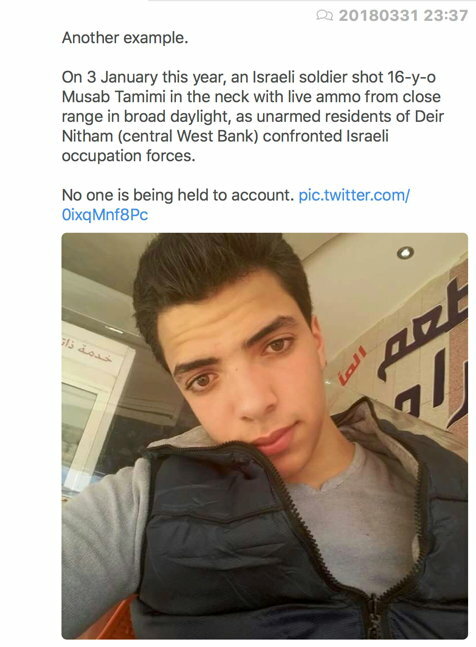 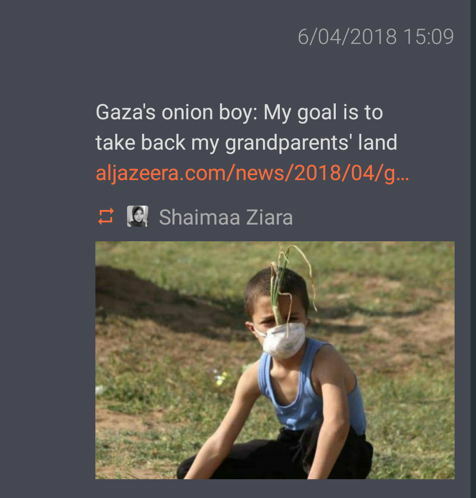 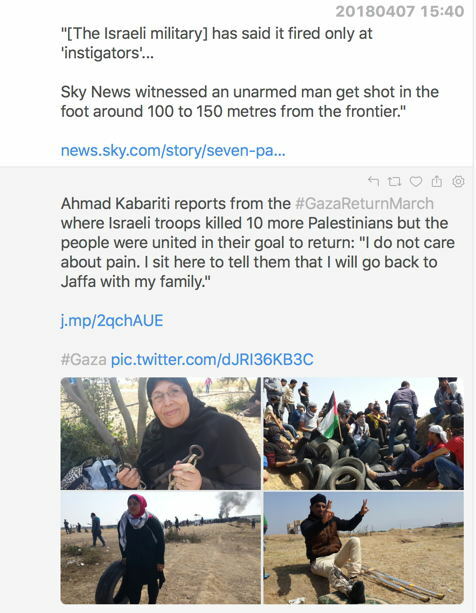 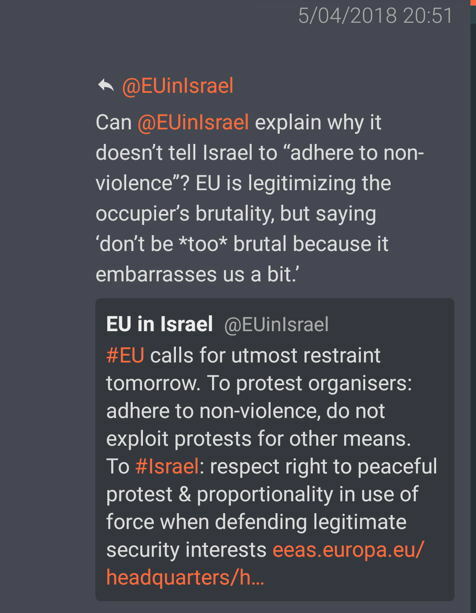 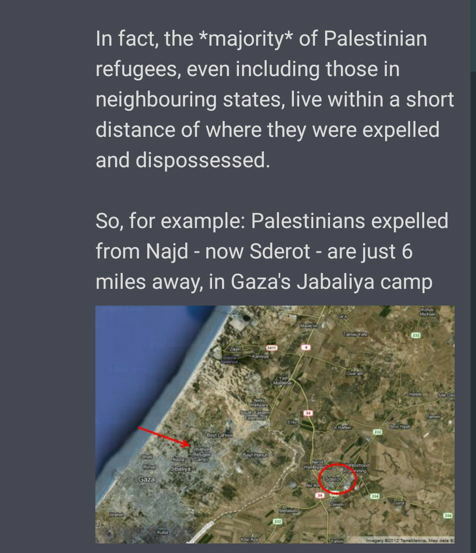 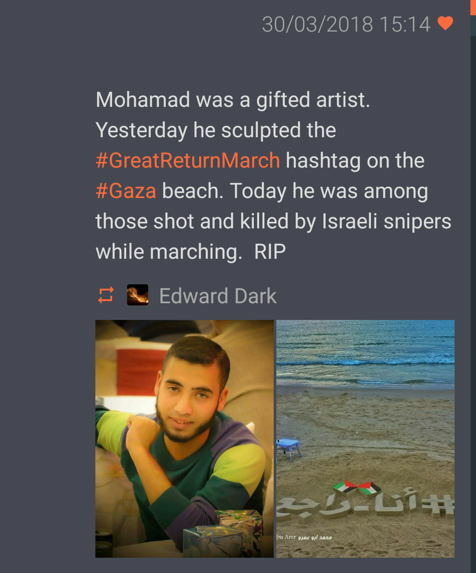 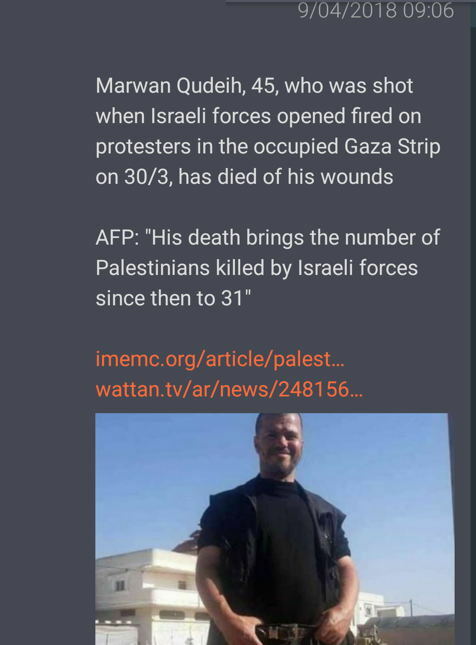 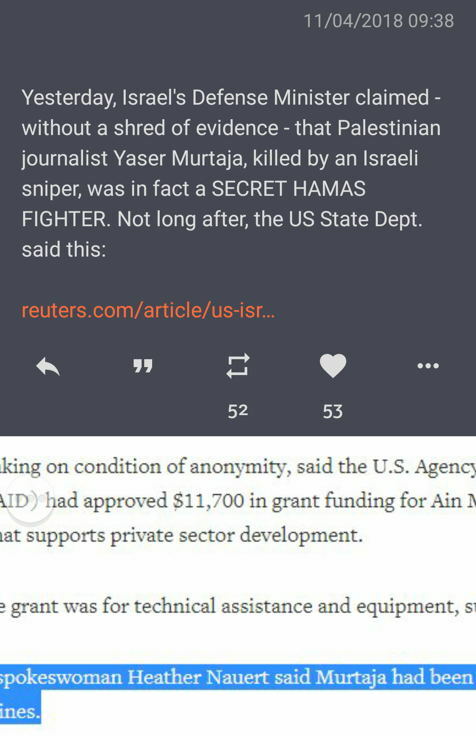 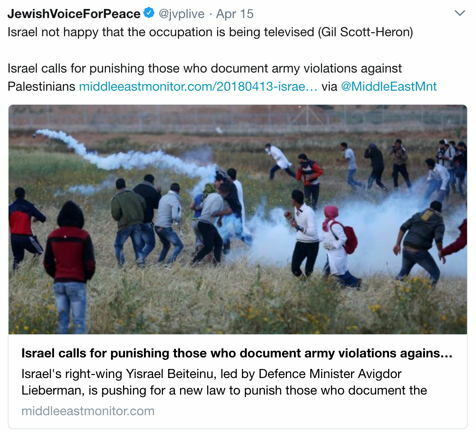 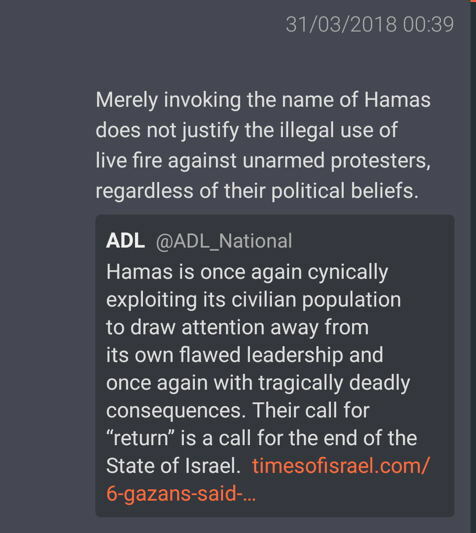 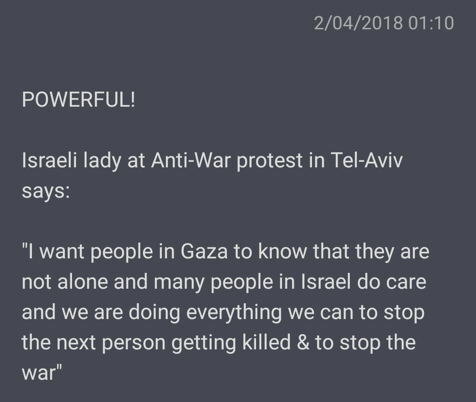 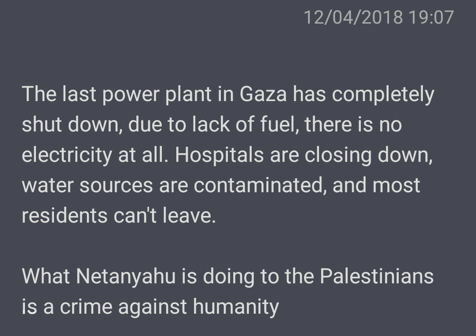 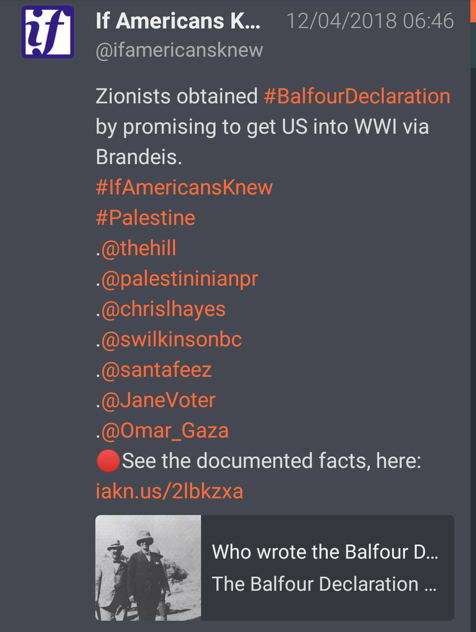 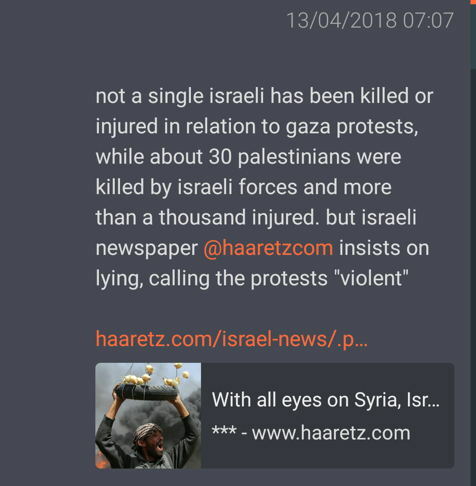 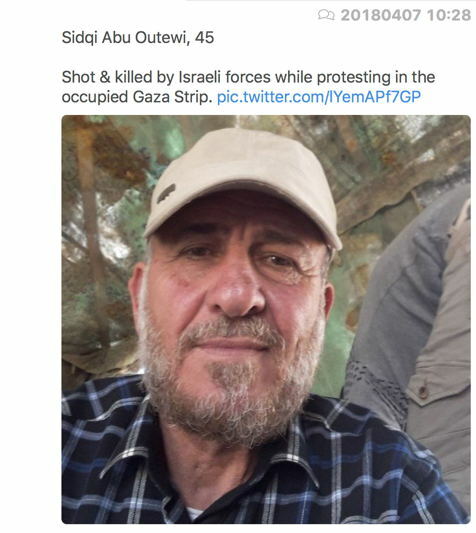 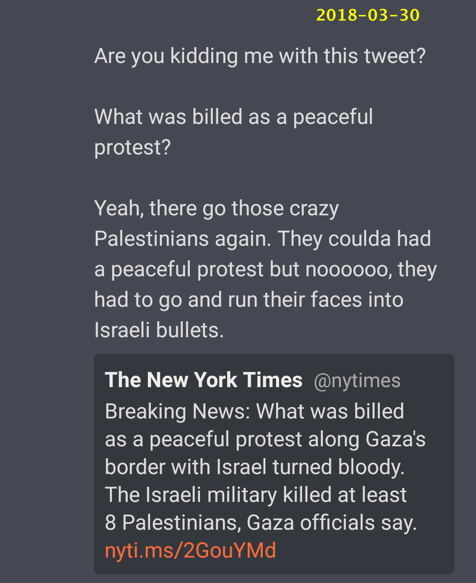 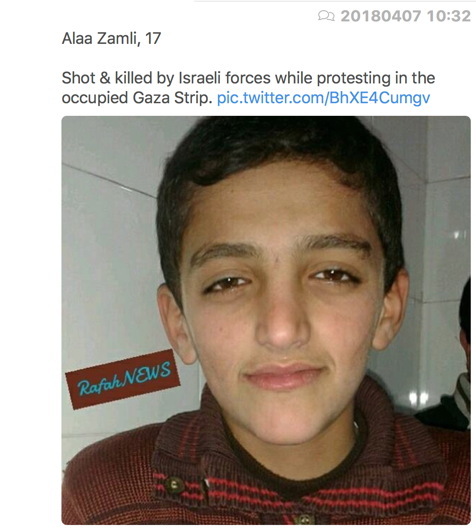 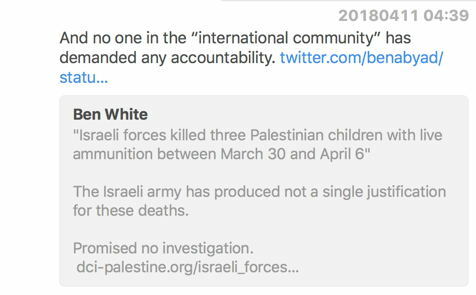 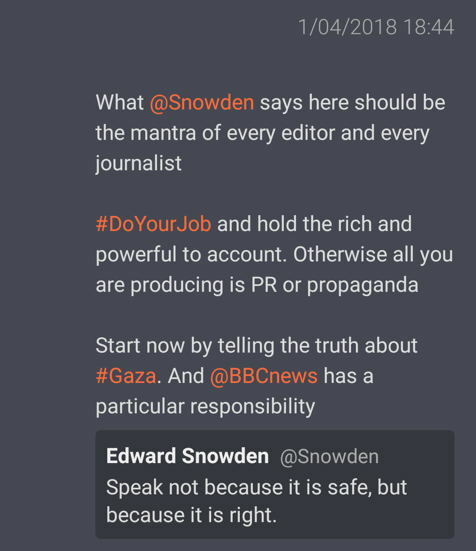 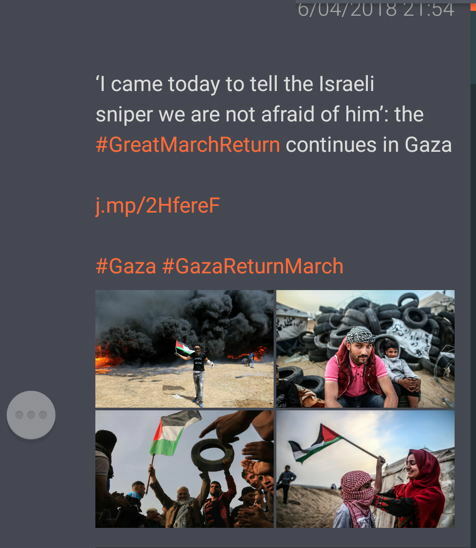 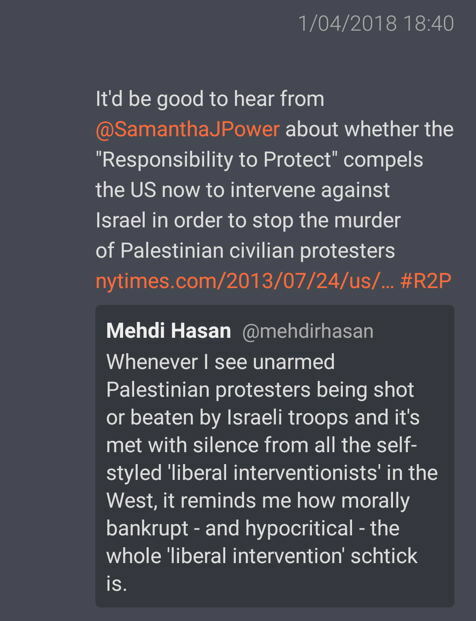 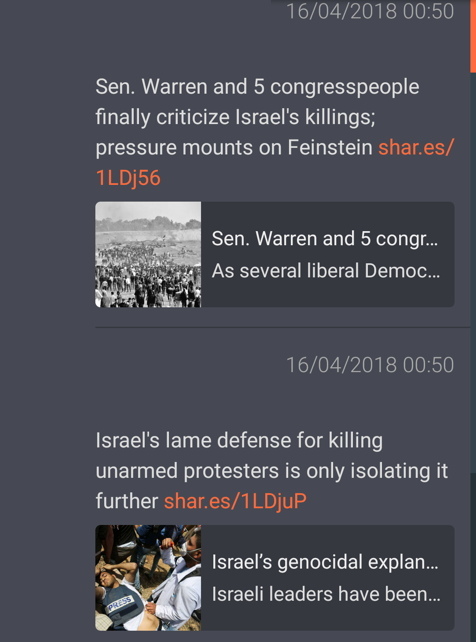 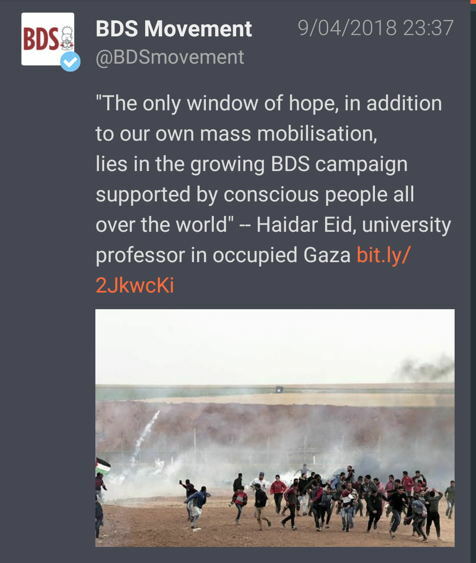 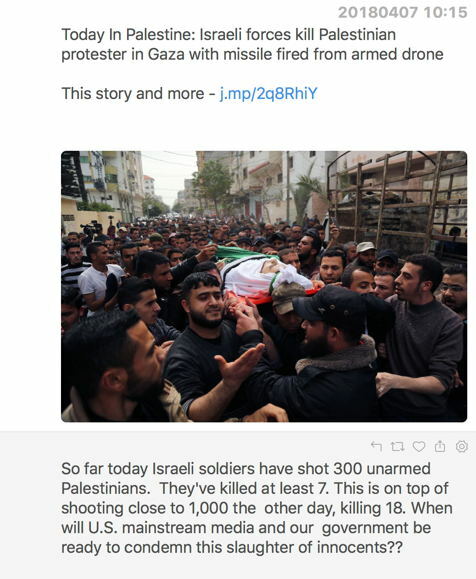 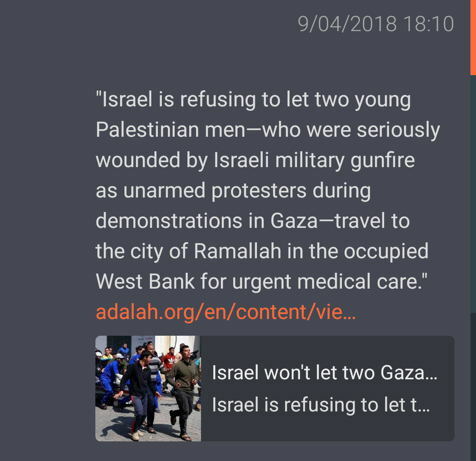 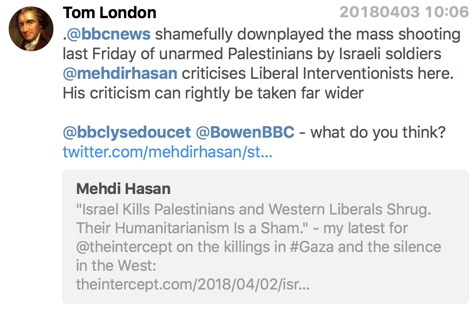 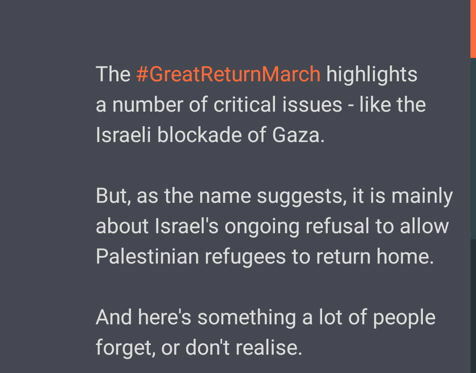 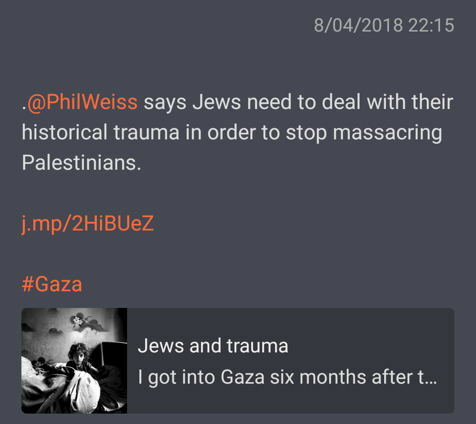 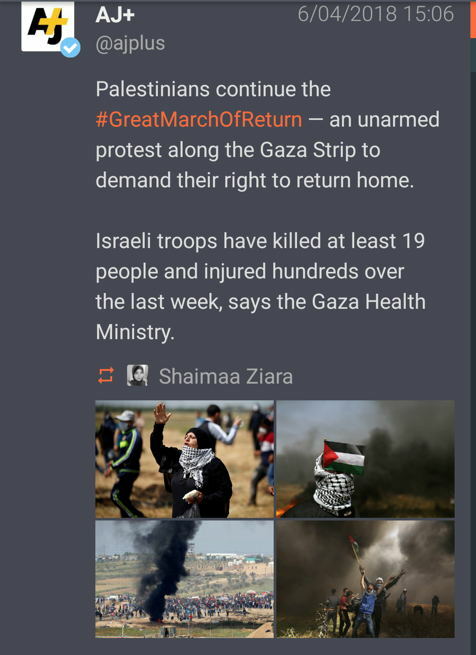 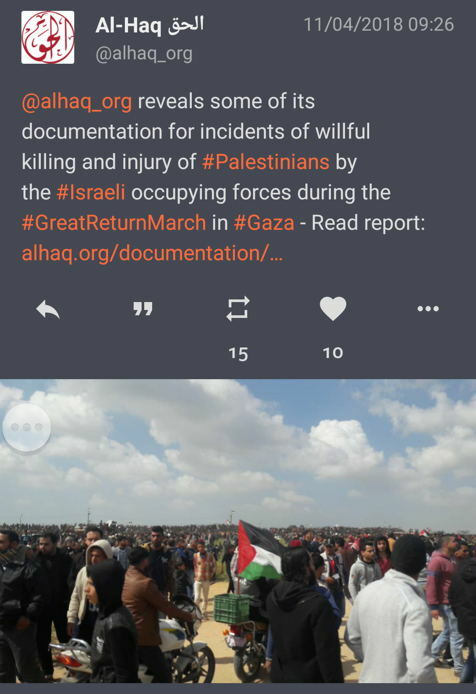 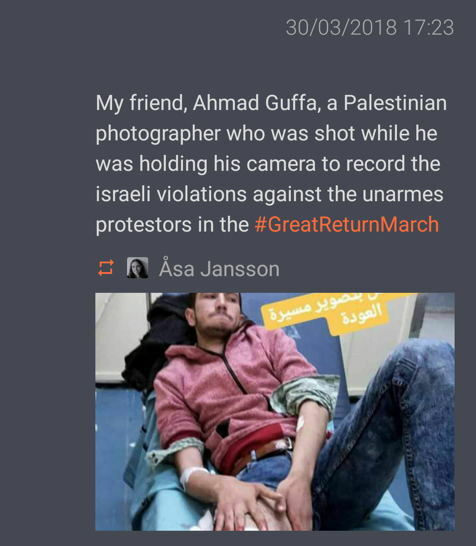 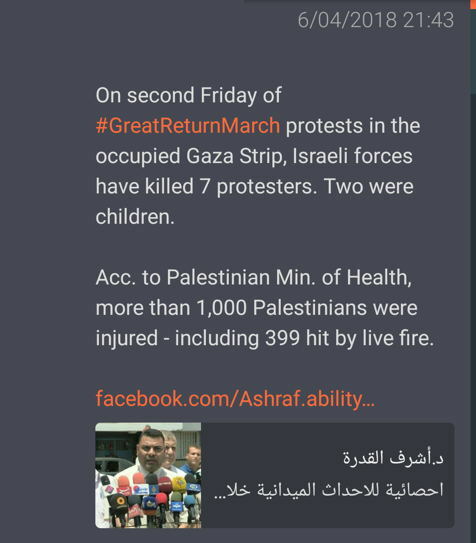 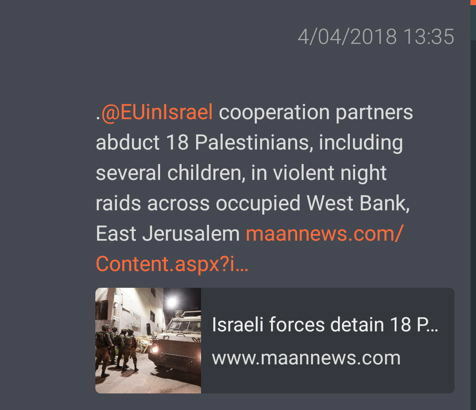 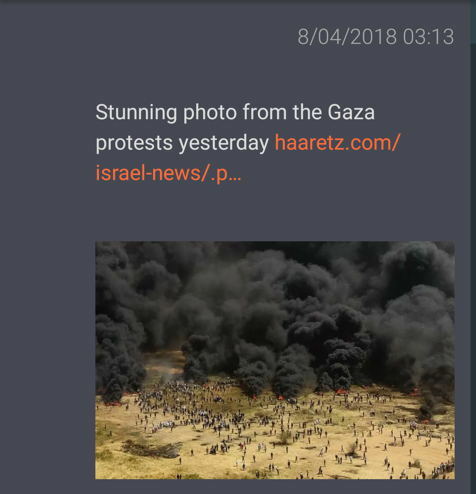 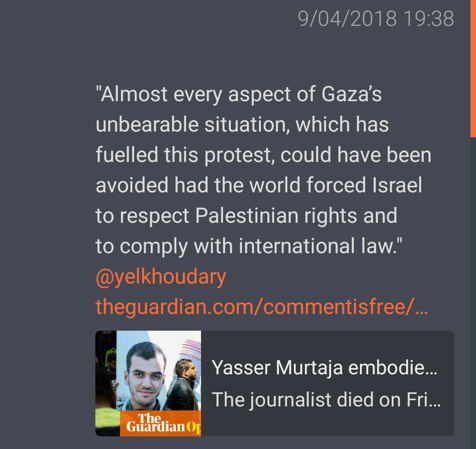 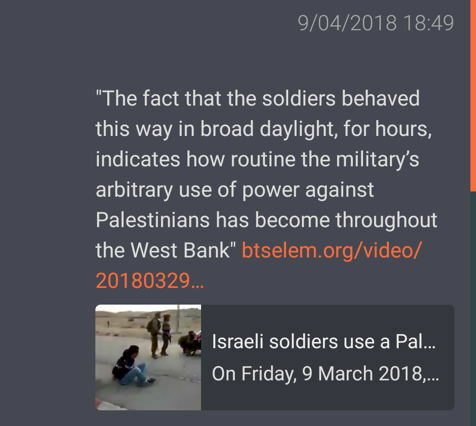 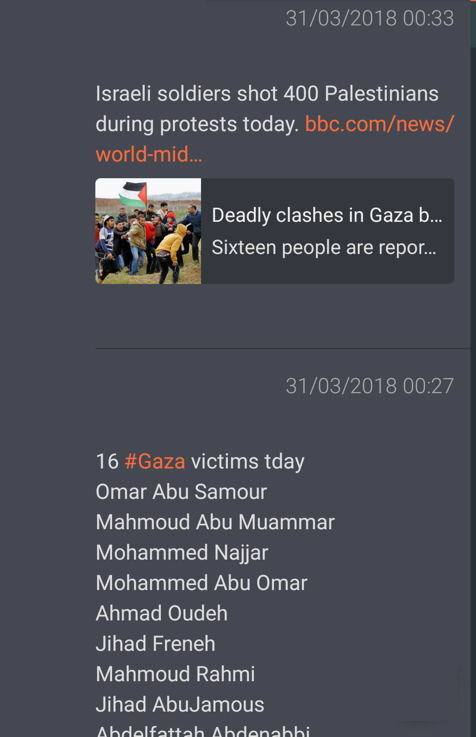 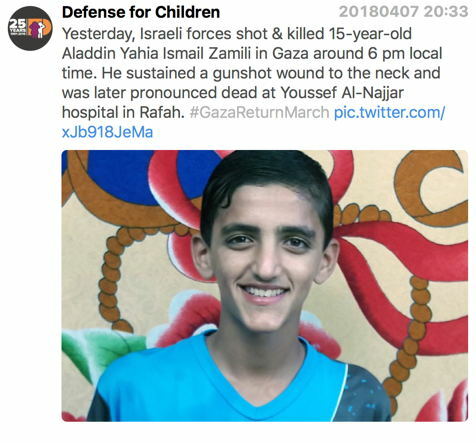 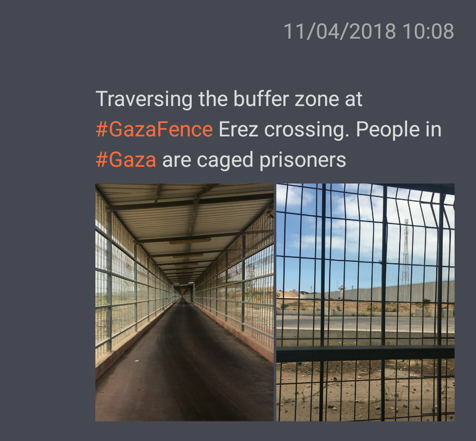 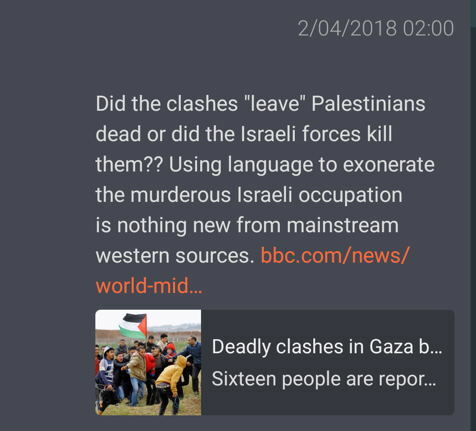 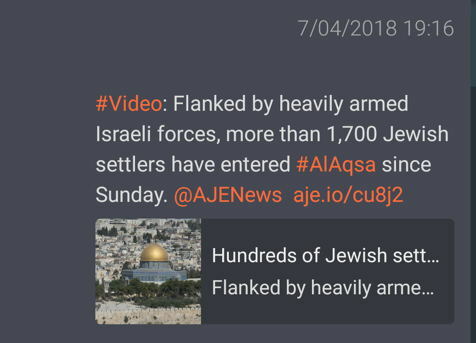 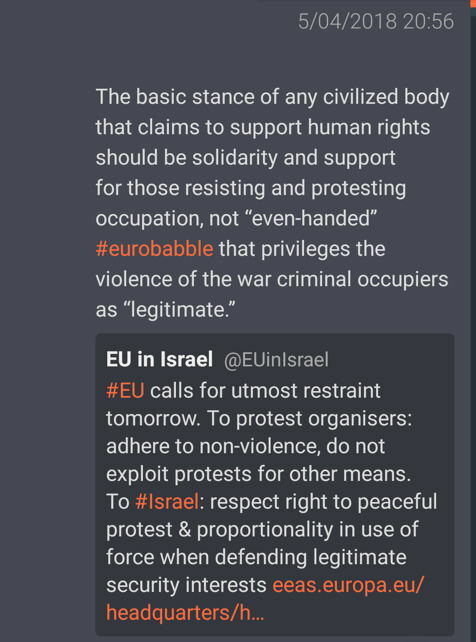 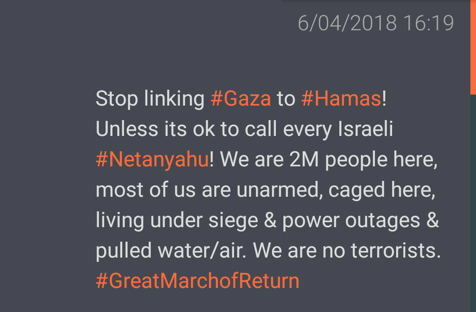 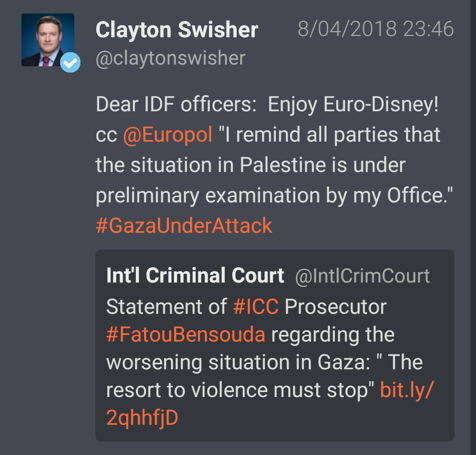 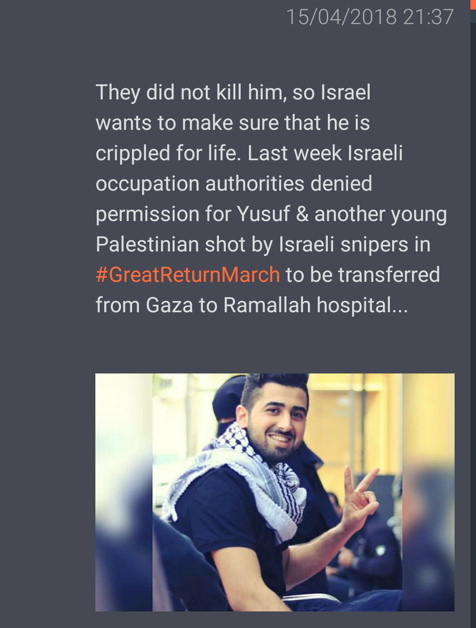 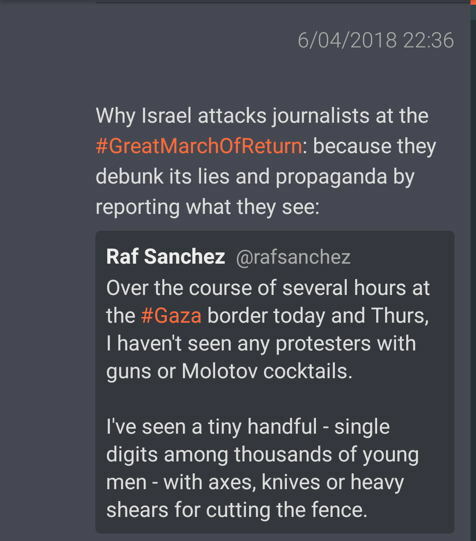 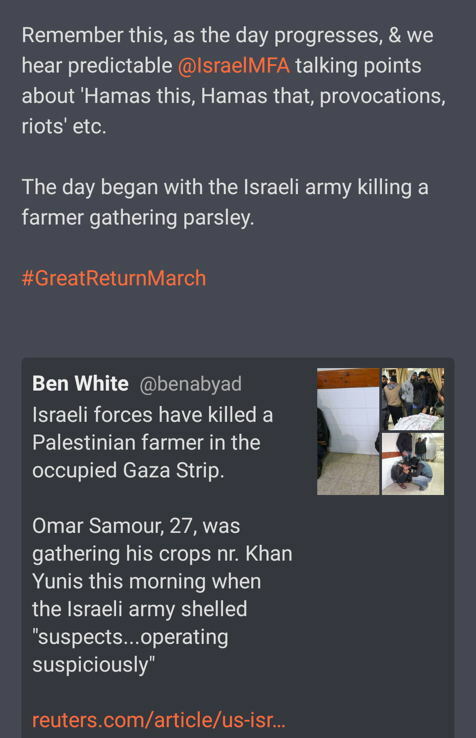 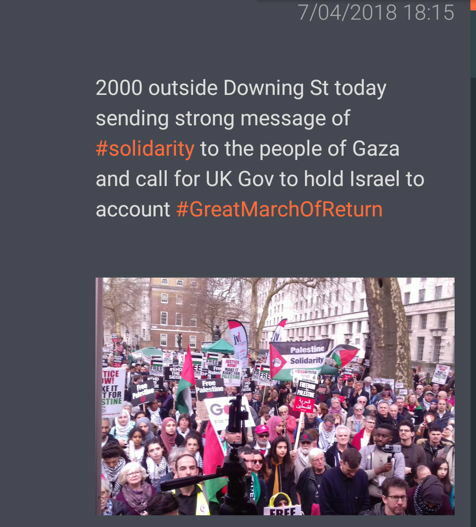 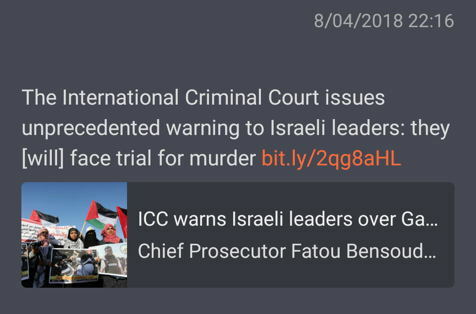 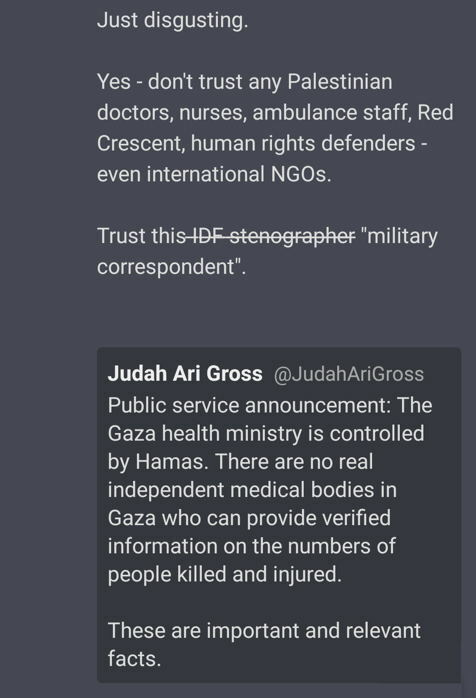 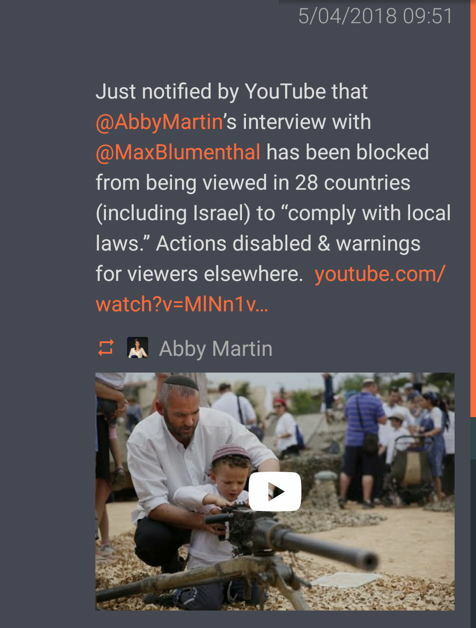 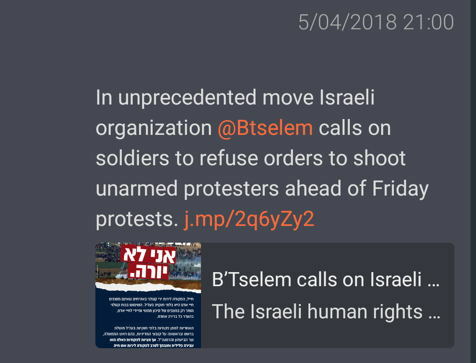 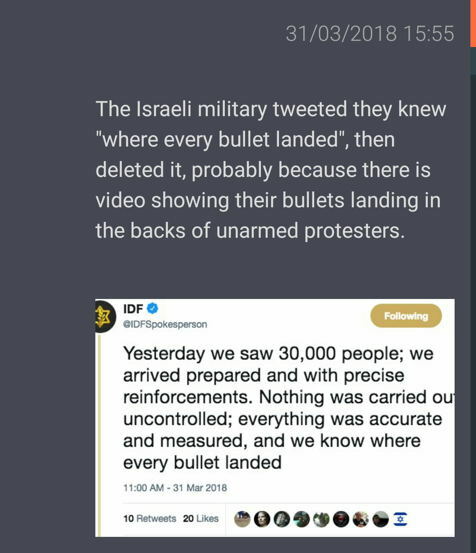 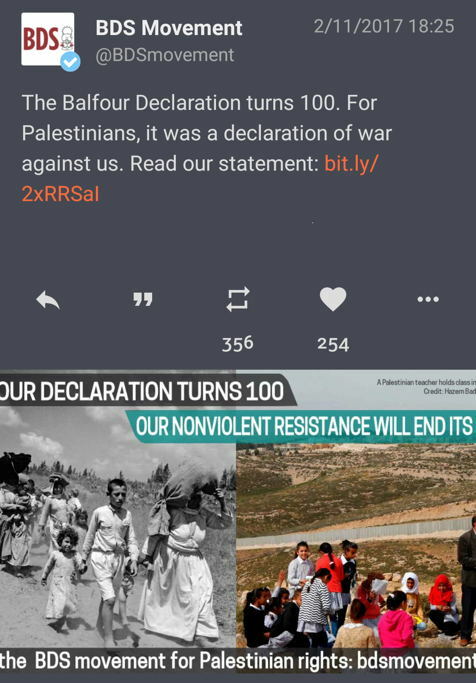 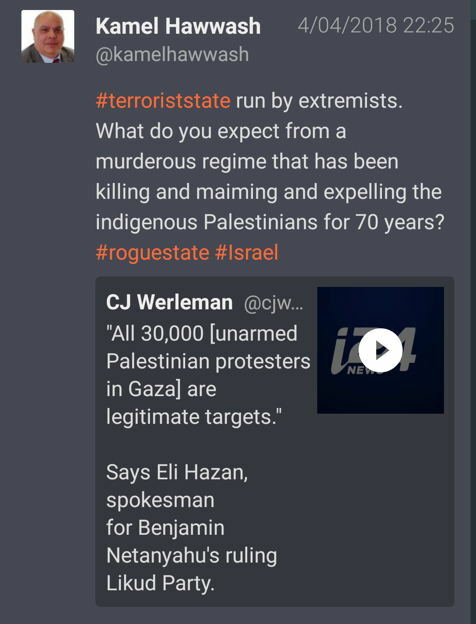 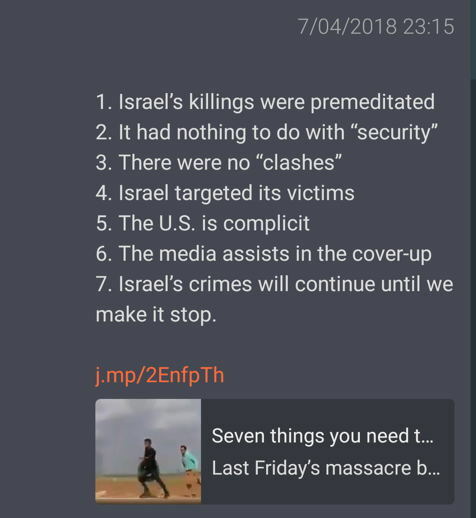 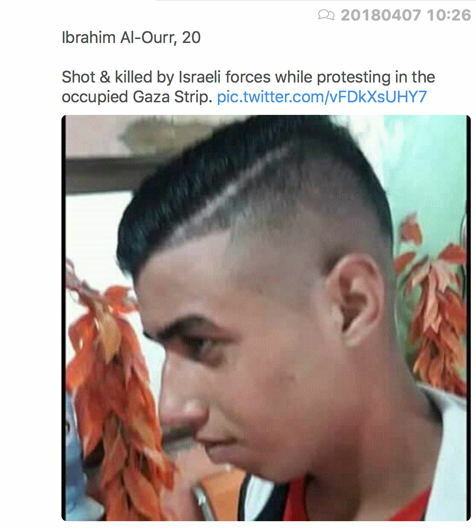 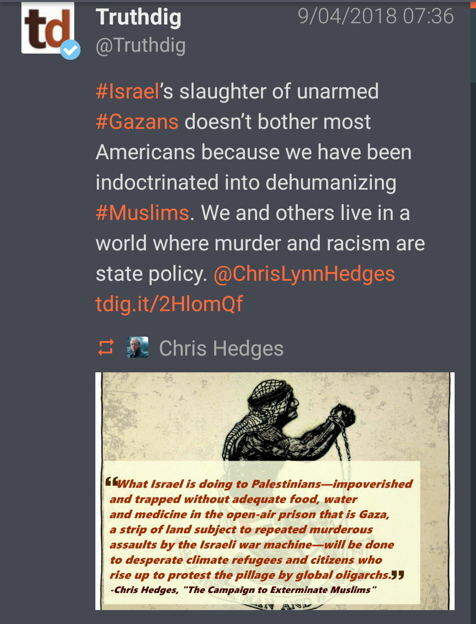 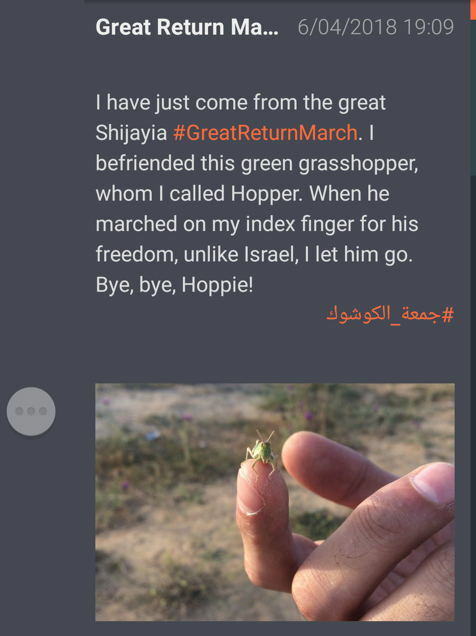 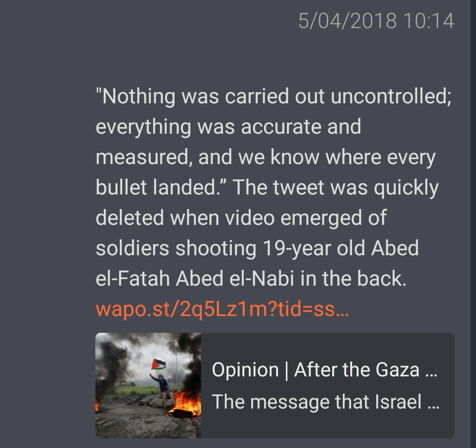 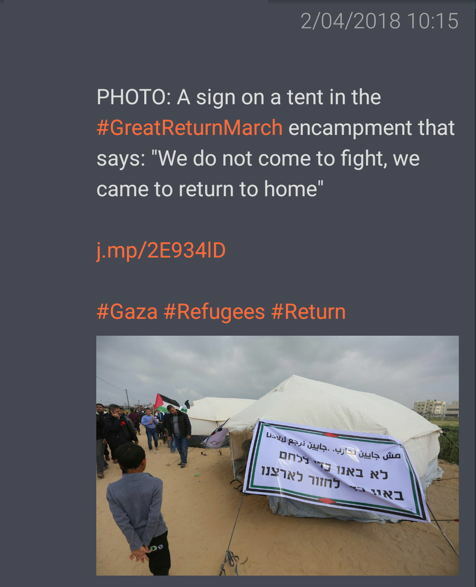 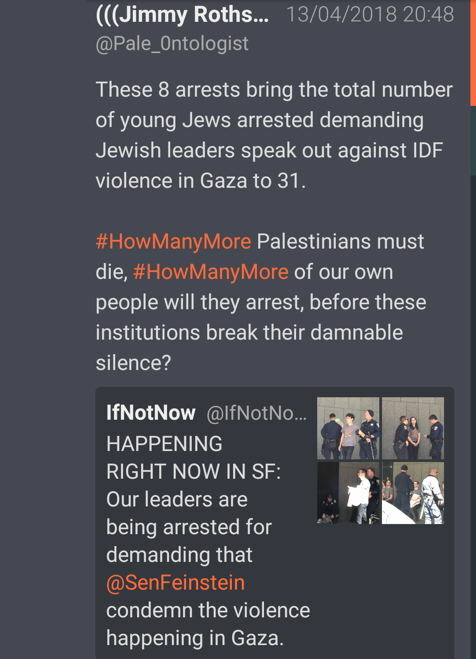 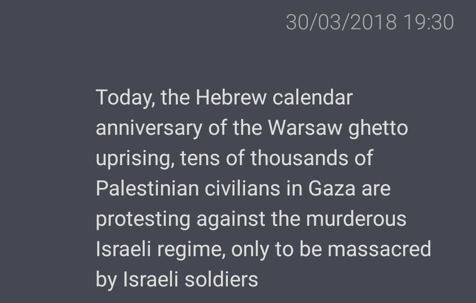 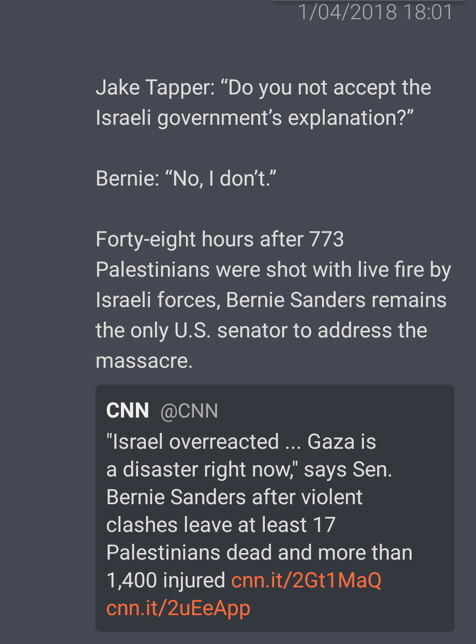 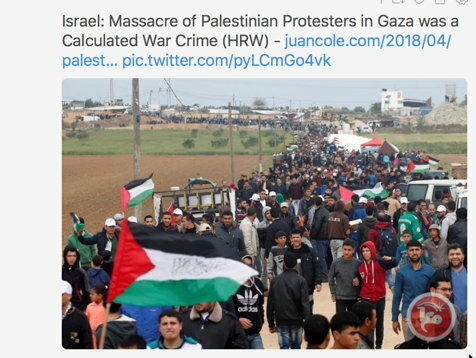 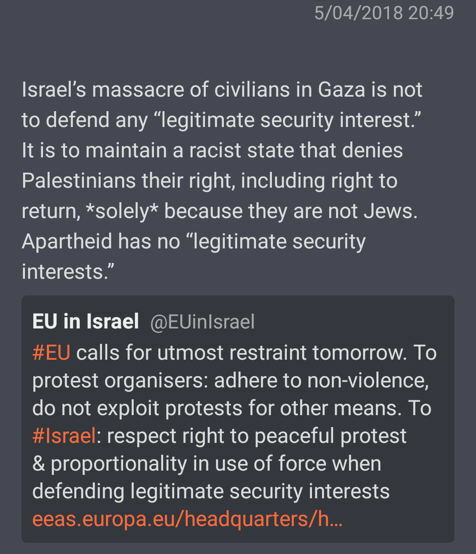 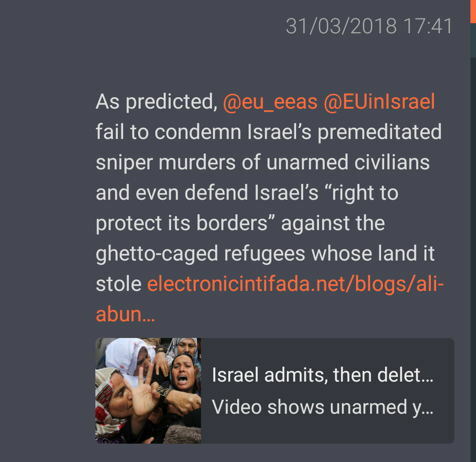 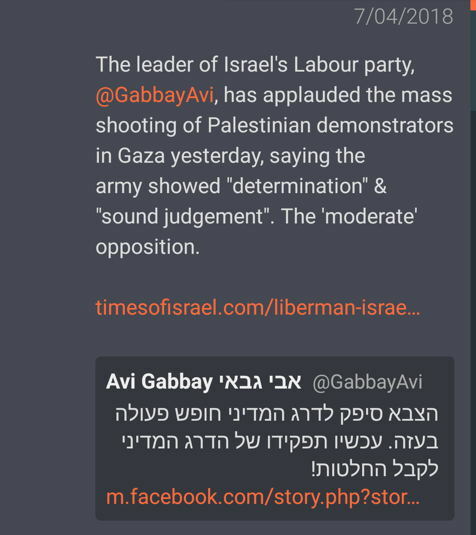 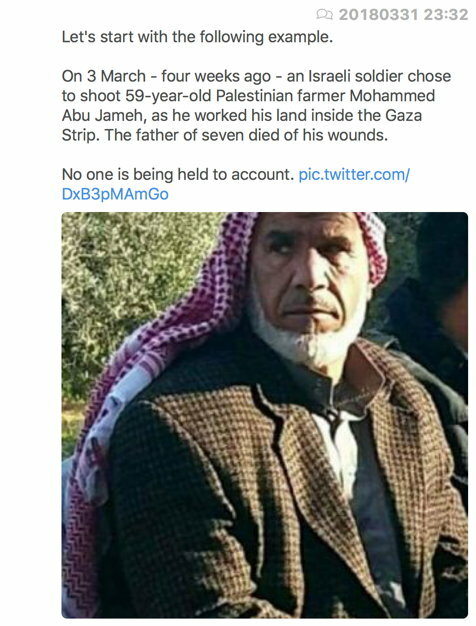 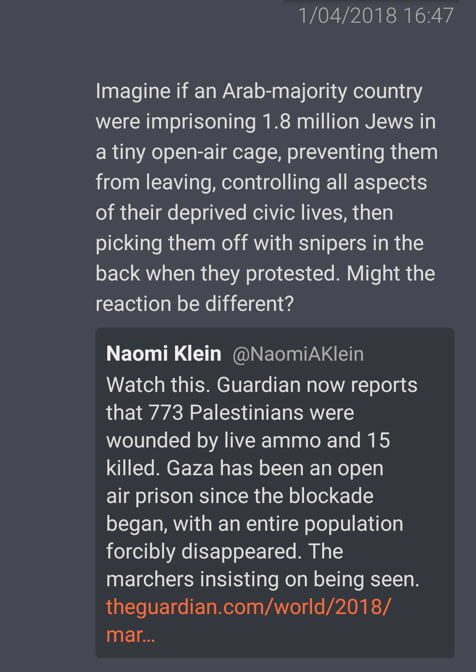 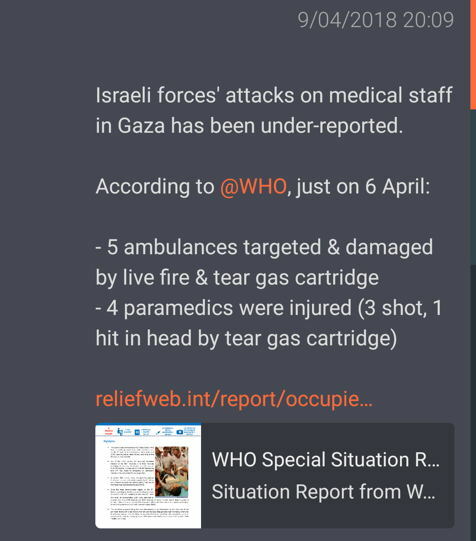 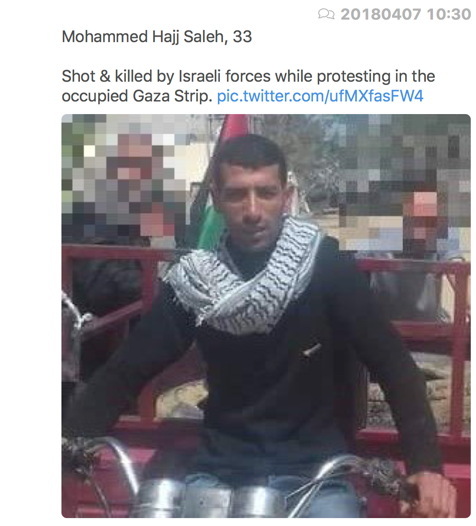 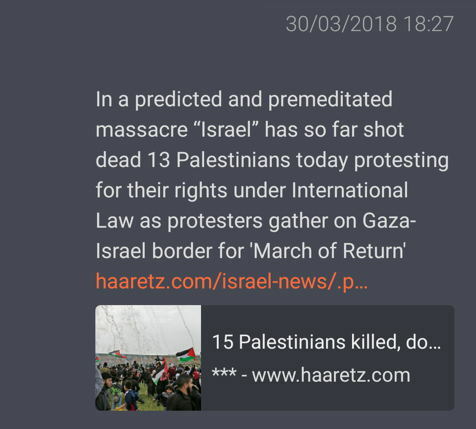 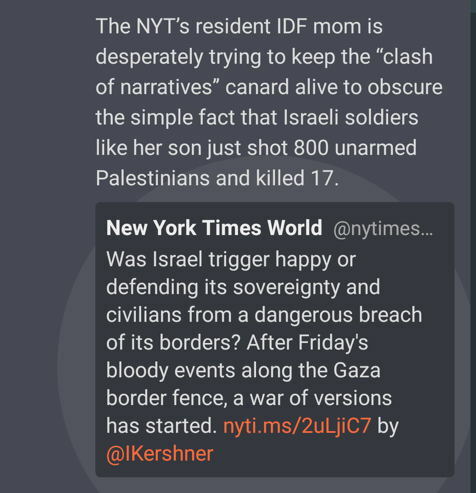 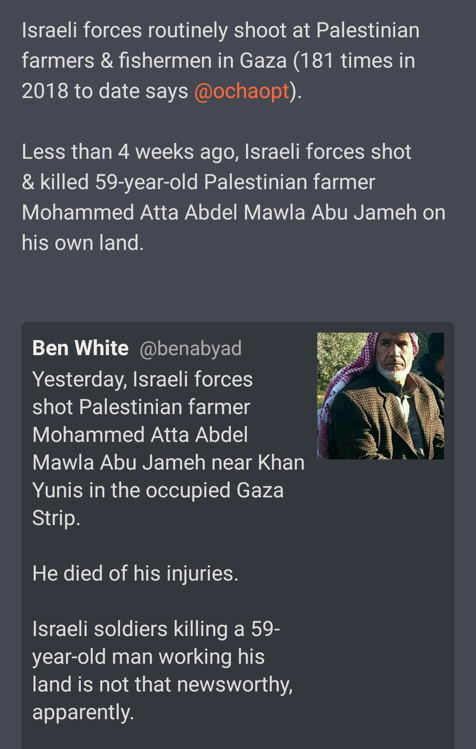 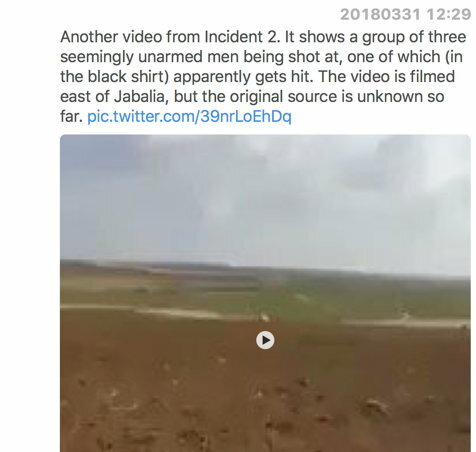 Below are screenshots from Twitter tweets (from 2018-03-29 to 2018-04-17+) by independent observers of the #GreatReturnMarch, where Palestinians from Gaza showed their frustration of the dismal living conditions in the world's largest open-air prison. 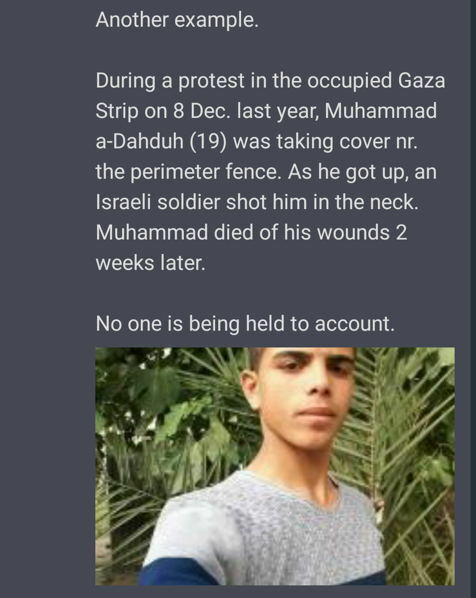 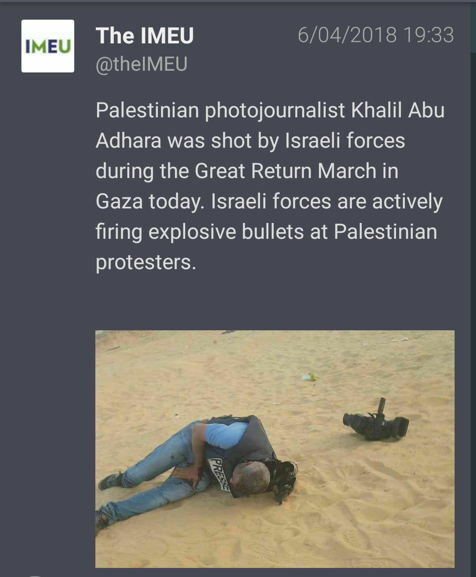 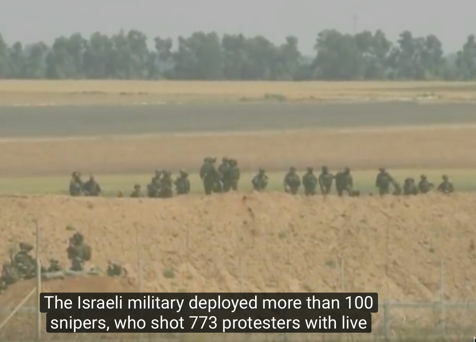 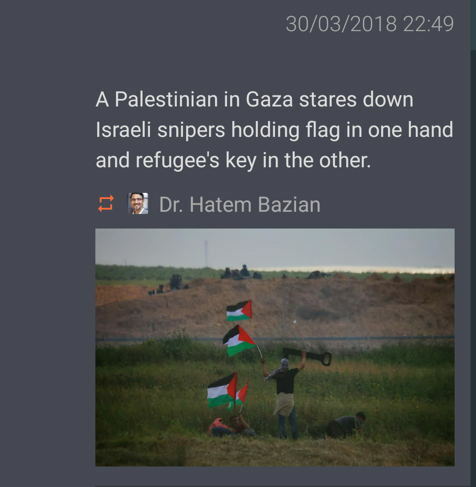 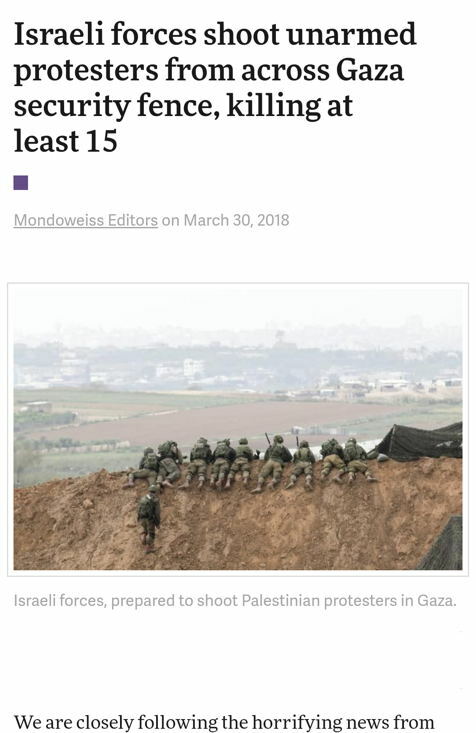 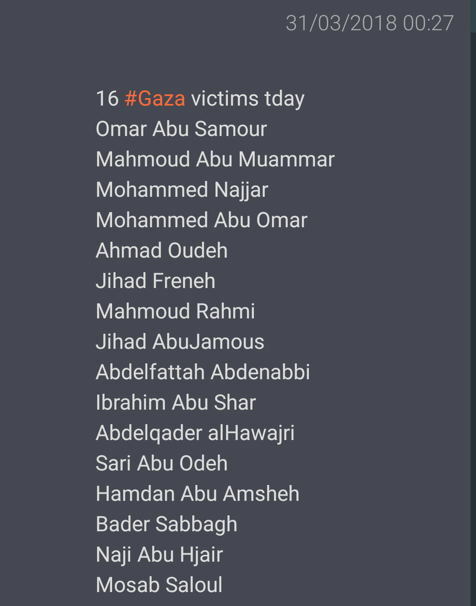 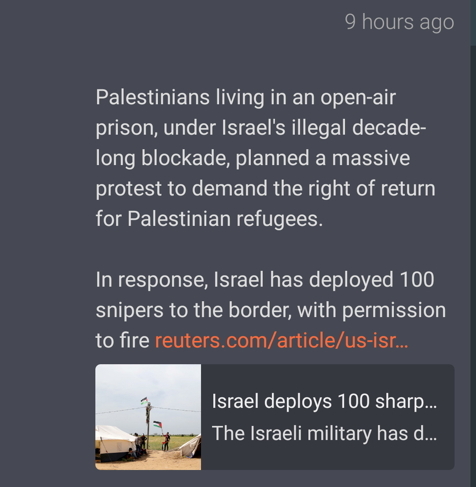 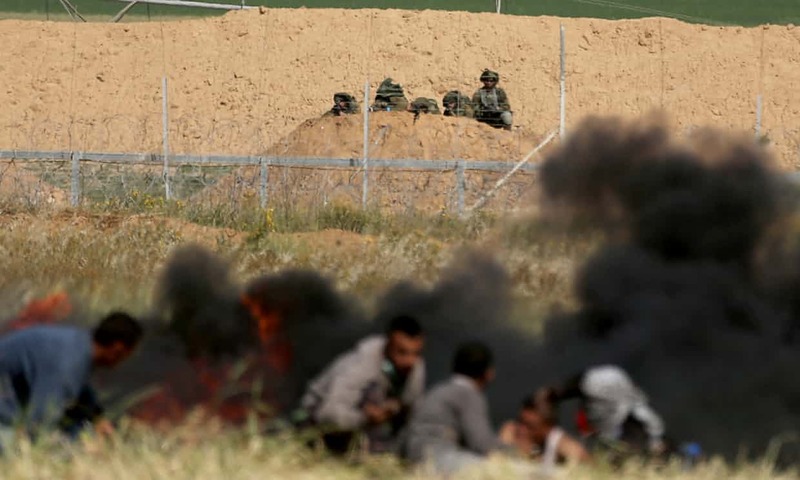 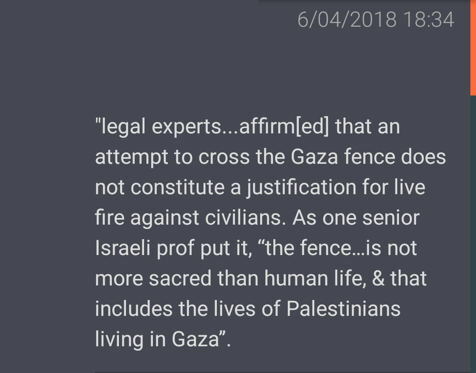 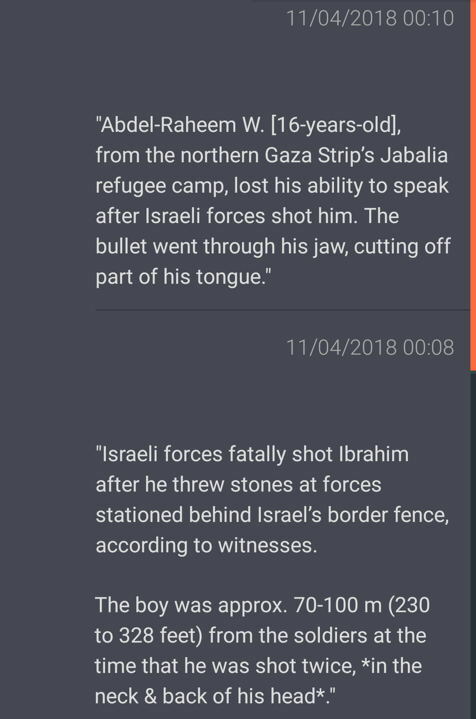 However while still inside the Gaza fence, the Israel army's 100 snipers opened live fire at the unarmed Palestinian Muslim people, killing about 30 and injuring about 1700! 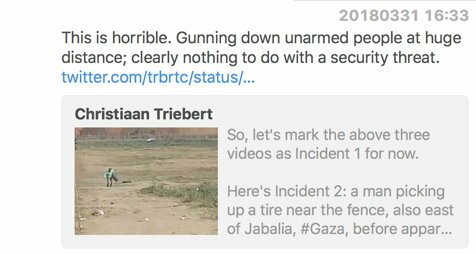 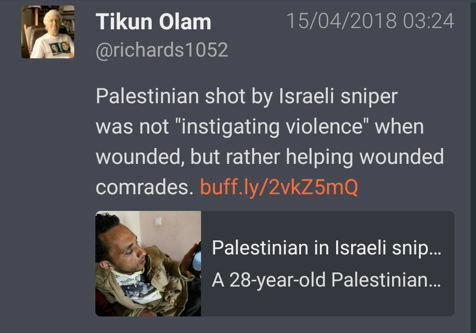 Killing and maiming civilians, and - most gruesome - some of the snipers even enjoyed their awful actions! 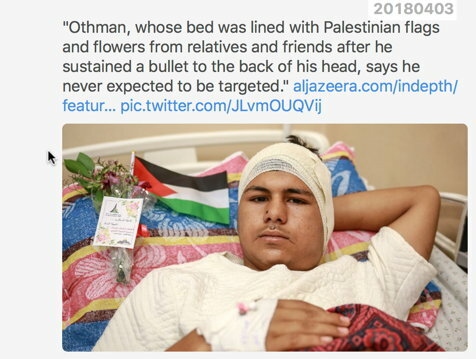 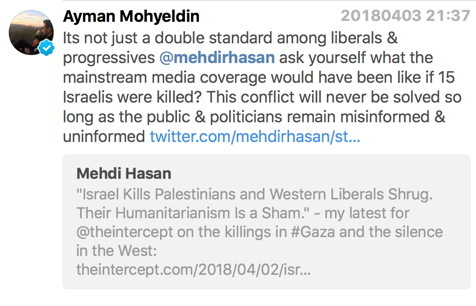 Read Ahmad Abu Rtemah's article to take in the other side, which is most of the time silenced and censured in Western media: The voice of Palestine. 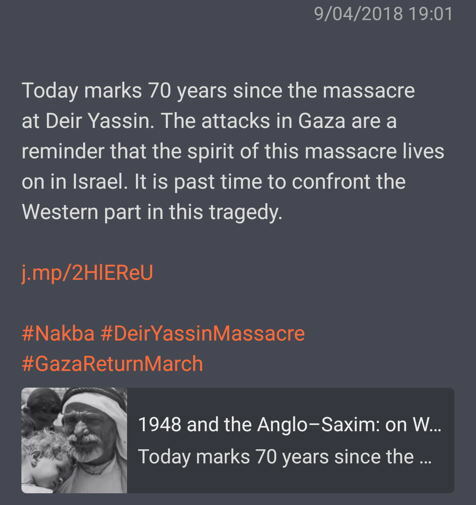 The Nakba*** is not a just a memory, it is an ongoing reality. 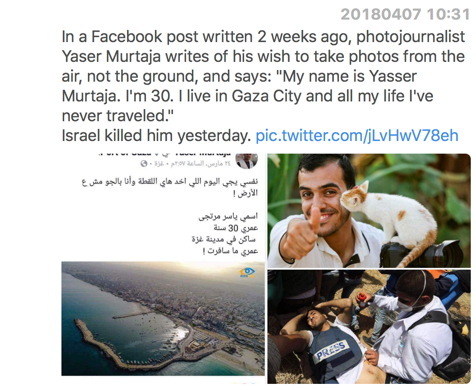 We can accept that we all must eventually die; in Gaza, the tragedy is that we don’t get to live. 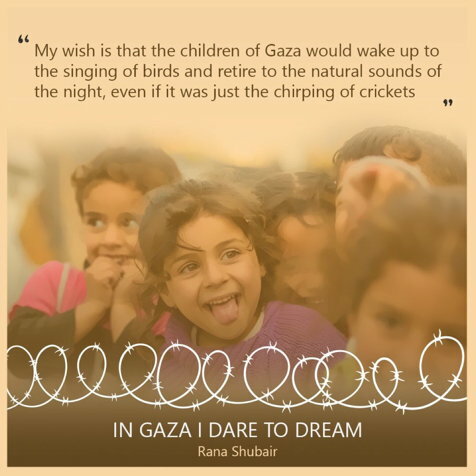 ”I have never seen my family’s home in Ramle, and my children have never seen anything beyond the confines of Gaza and the siege. 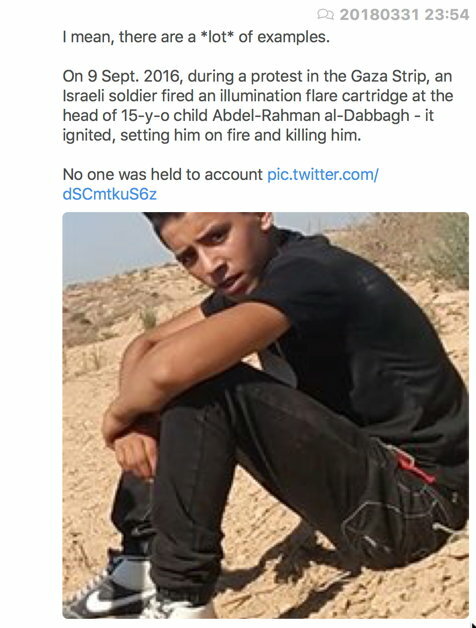 With my eldest just 7 years old and my youngest 2, they do not know a reality beyond the sound of bombs, the darkness of night with no electricity, the inability to travel freely—or the fact that these things are not normal. 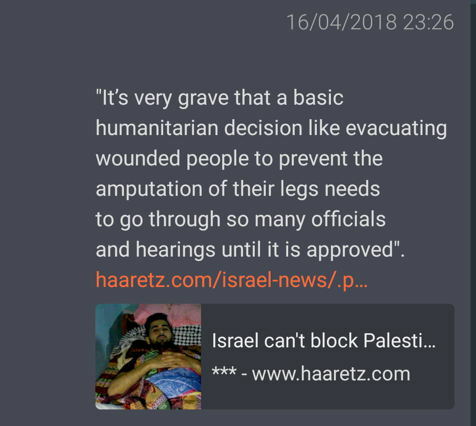 Nothing about life in Gaza is normal. 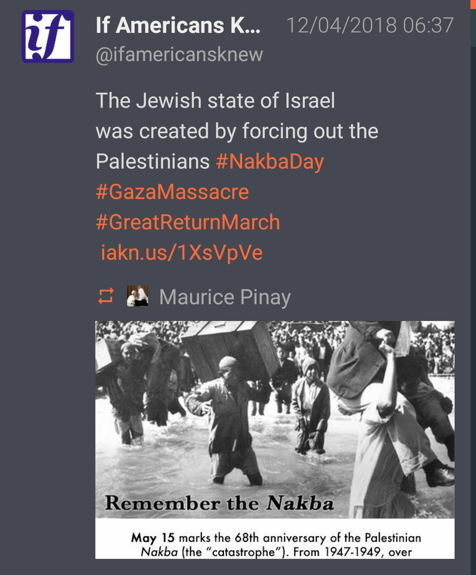 The Nakba*** is not a just a memory, it is an ongoing reality. 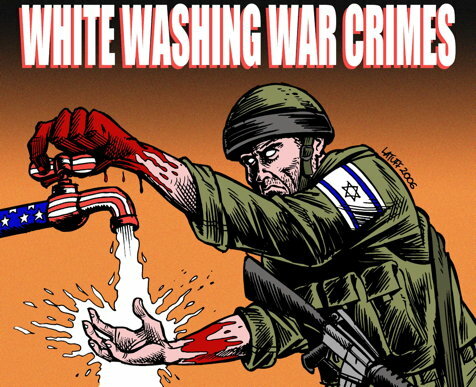 ”It is in spite of this harsh reality that we endure. 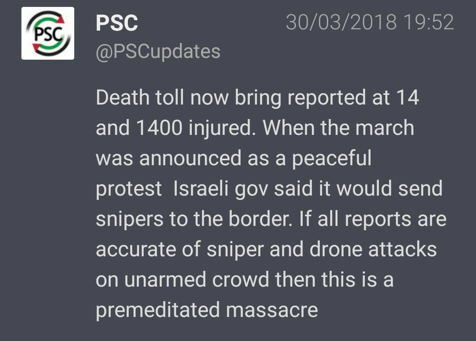 The last two Fridays, we stood against all the powers telling us to break and die in silence and decided to march for life. 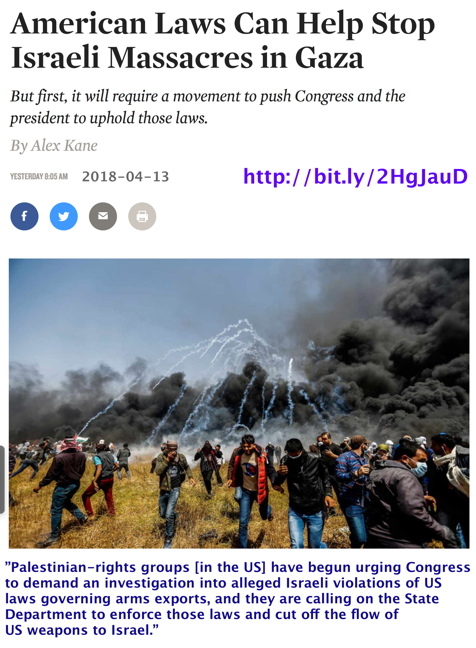 It is a protest of a people who want nothing more than to live in dignity. 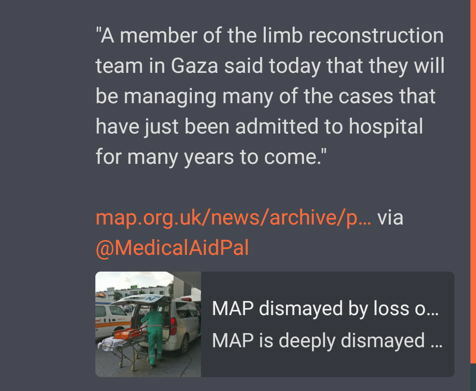 ”The UN warned that Gaza may be uninhabitable in just two years. 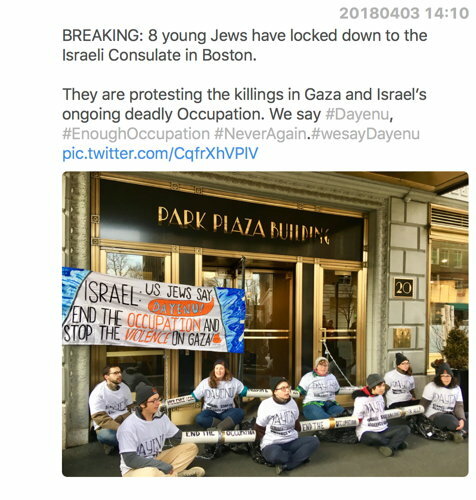 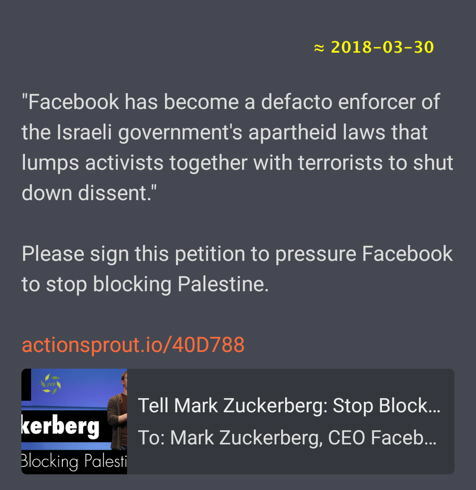 Resisting the fate that Israel has planned for us, we are fighting back peacefully with our bodies and our love for life, appealing to the justice that remains in the world. 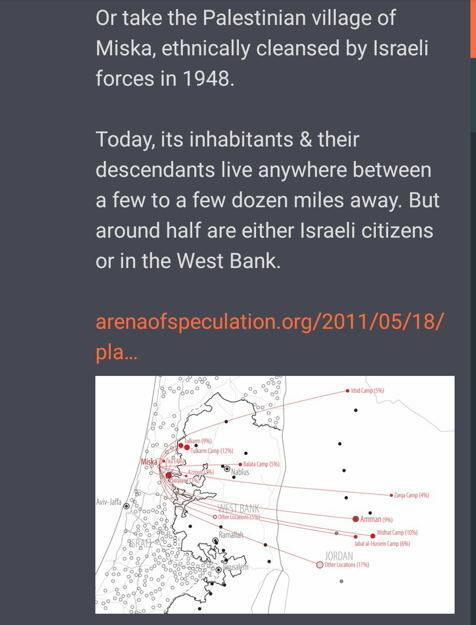 - Nakba: The 1948 Ethnic Cleansing of Palestine: The forceful expulsion of a large part of the Palestinian people from their ancestral homes in 1948. 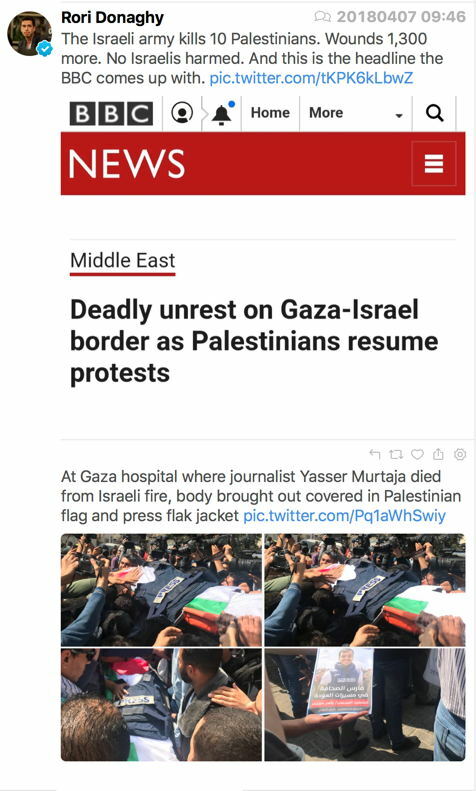 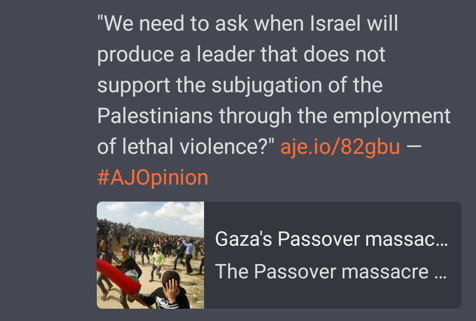 □ comment: Although the victims no.1 are the Palestians, who get discriminated against, arrested, shot and killed on a daily basis! 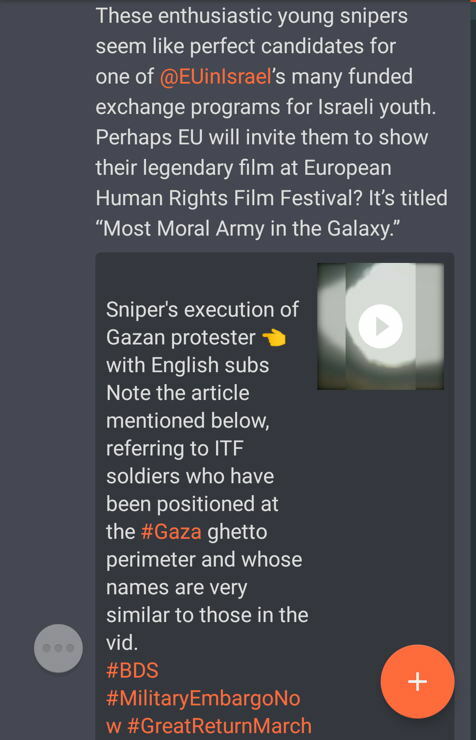 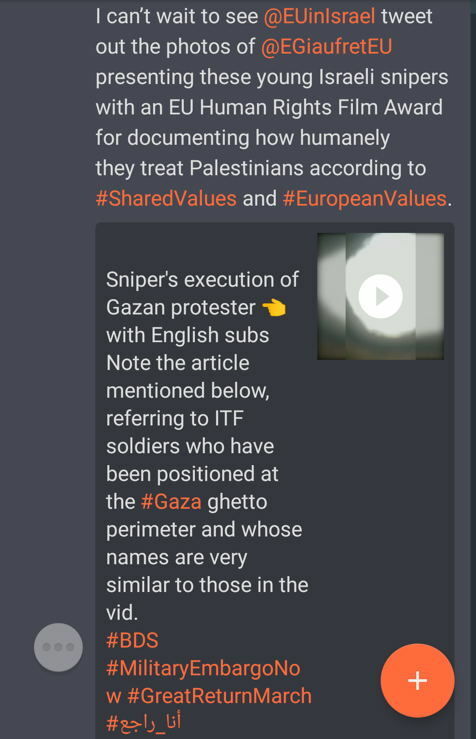 ”We, a group of former combatants who were members of sniper teams, seek to express our feelings of distress regarding the recent incidents in the Gaza Strip. 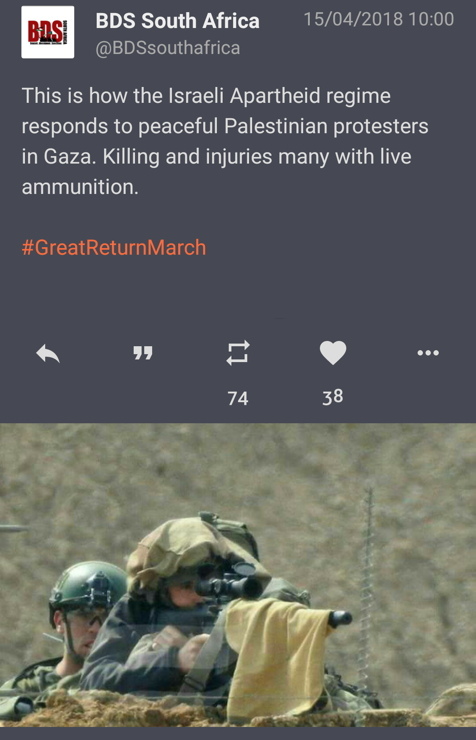 As we hear about military orders permitting snipers to fire live ammunition at unarmed demonstrators, we are filled with shame and sorrow: shame at the orders devoid of moral and ethical judgment, and sorrow for the young soldiers, whom, as we know very well from our own experience, will always carry with them the scenes that they witnessed through the sights of their rifles. 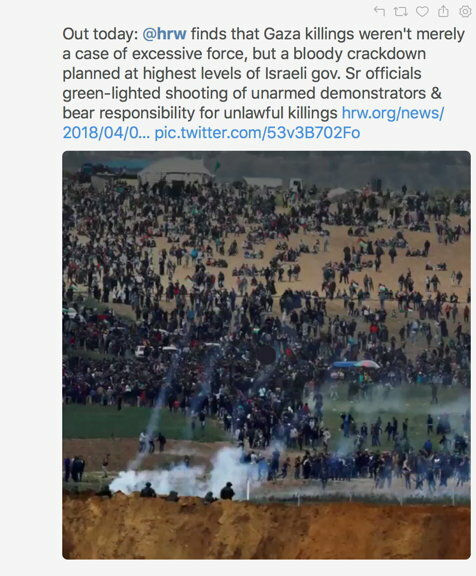 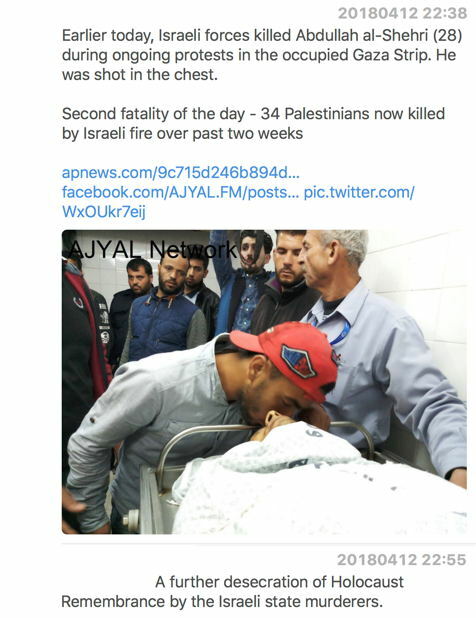 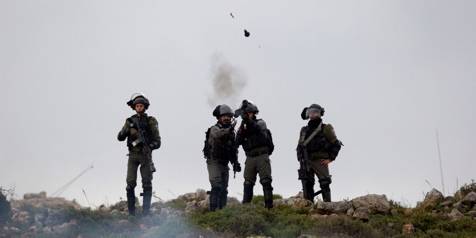 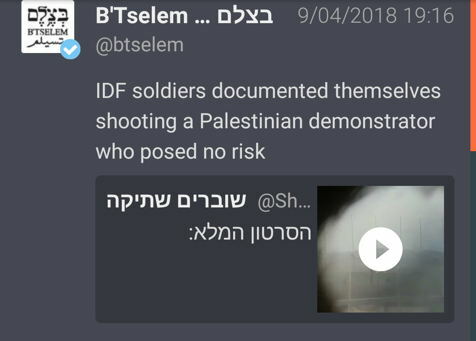 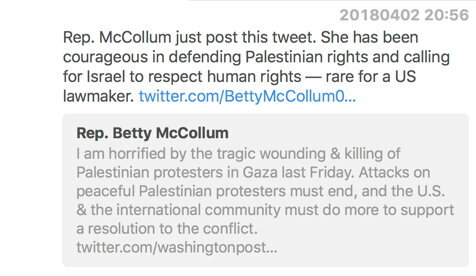 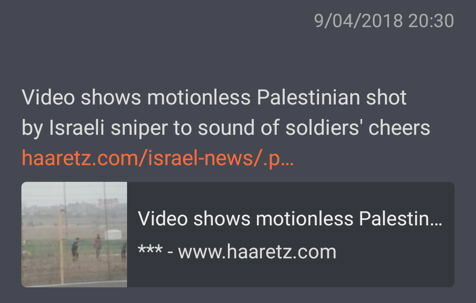 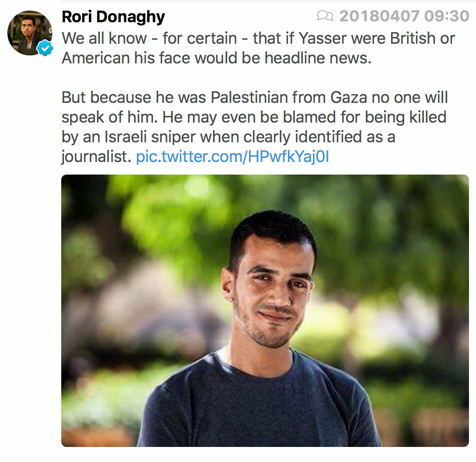 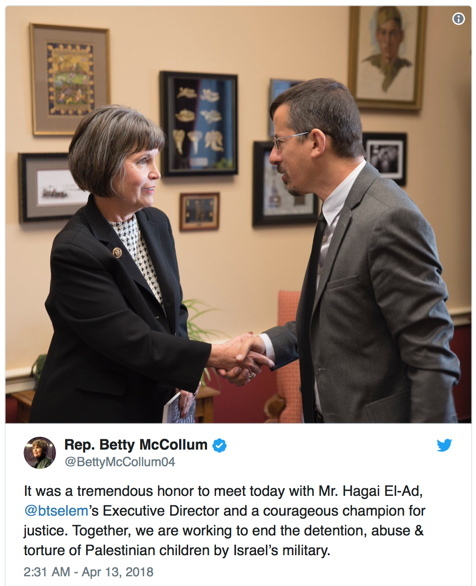 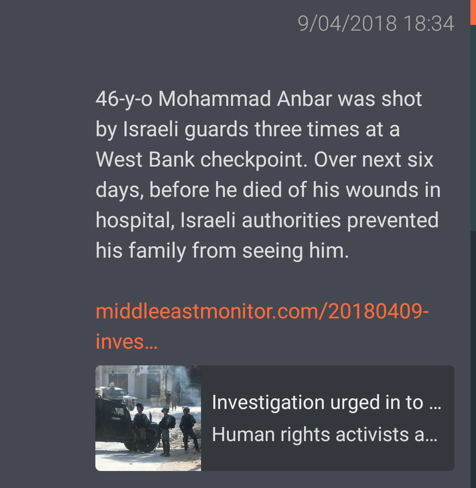 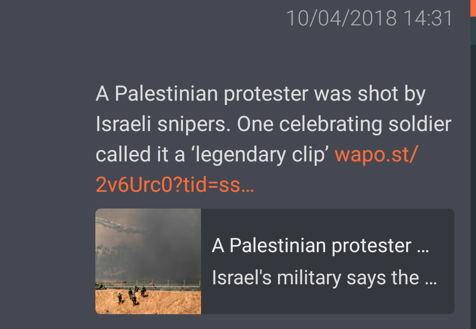 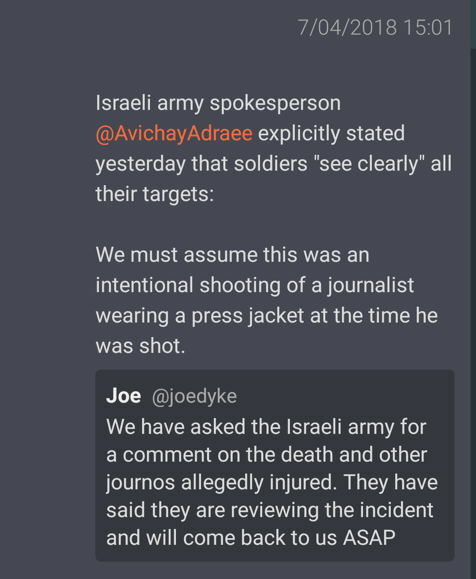 ”Instructing snipers to shoot to kill unarmed demonstrators who pose no danger to human life is another product of the occupation and military rule over millions of Palestinian people, as well as of our country’s callous leadership, and derailed moral path. 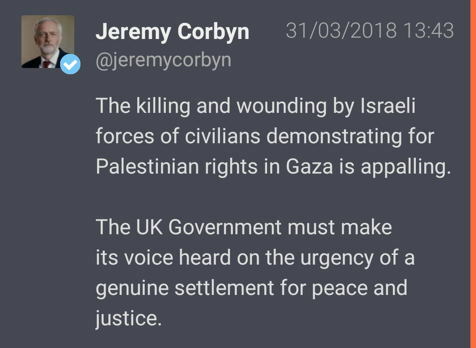 ”Harming innocent people in Gaza is part of what is needed to maintain the regime of occupation, and we must not allow it to continue. 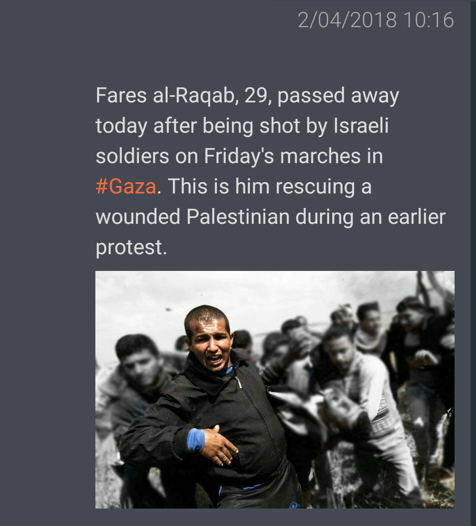 Only ceasing to militarily control the Palestinian people will bring this to an end. 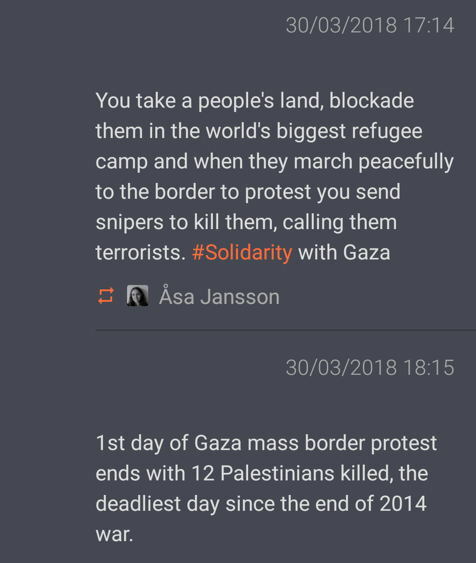 □ comment: There are those courageous people with their heart and humanity intact, however very many seem to be the opposite (see below). 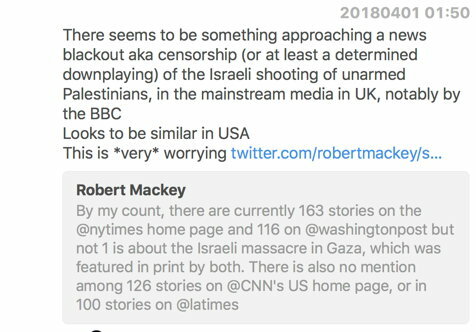 A considerable part of this tragedy is the (self-imposed if not structural → ownership) censorship of mainstream media. 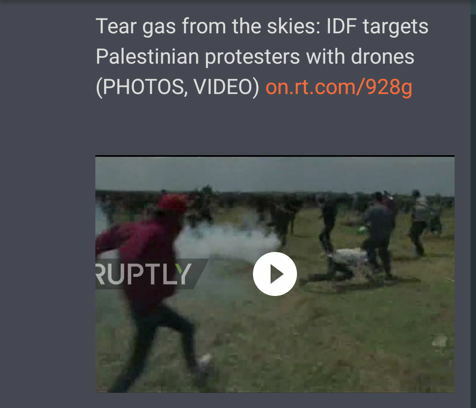 Hover for big size + [1 video] - Warning, graphic images!